Under the new “law on regulation of health practitioners”, promulgated by the Cambodian Ministry of Health in December 2016, which aims to protect the health and safety of members of the public, by providing mechanisms to ensure that all health practitioners are qualified, competent and fit to safely practice their profession. The Cambodian Councils of nurses (CCN) and Cambodian Midwives Councils (CMC) are responsible for the implementation of the law and for establishment of the system for licensing/re-licensing health professionals. The councils introduced the concepts of CPD (Continuous Professional Development) as the requirement for initial licensing and re-licensing of healthcare professionals. GIZ Social Health Protection Project and its Public Private Partnership in Health Project, “Improving Occupational Safety and Health of Healthcare Workers in Hospitals in Cambodia” support the CCN and CMC to improve the skills of nurses and midwives (and thus quality of healthcare) through the award of CPD credit points, as part of the re-licensing process for healthcare professionals. One of the areas that the CCN and CMC asked the projects to support is to develop innovative ideas in CPD policy development, including incorporation of e-learning alongside with face to face training to increase the reach of CPD requirements. 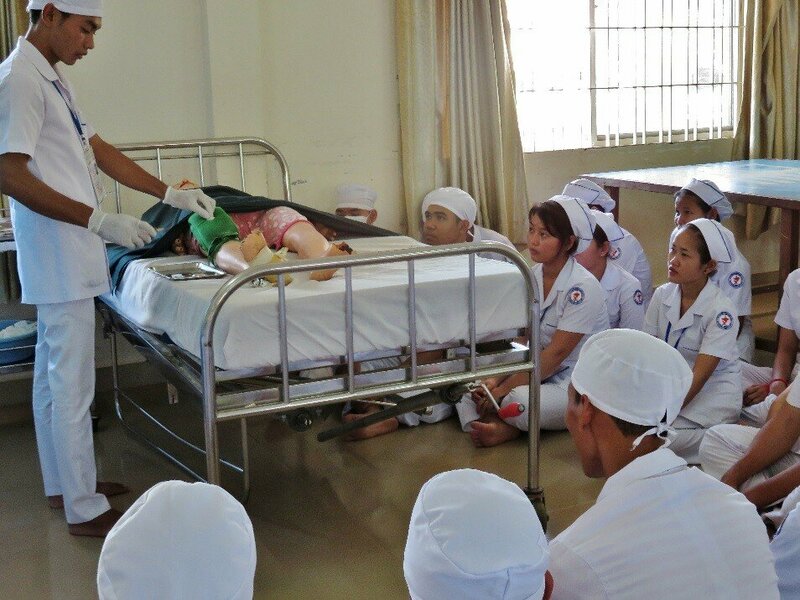 While the idea of e-learning holds promise in general; however, the lack of experiences of these methods in Cambodian health sector, the potential acceptability of this form of training by Cambodian nurses and midwives is little known. Thus the projects support the study conducted jointly with CCN/CMC to assess whether e-learning in general is acceptable to Cambodian nurses and midwives and whether the specific e-learning materials (hand hygiene) developed by Aesculap Academy (AA) in English are suitable for use by Cambodian nurses and midwives. The study is relied on information gathered during four focus group discussions using a 60 minutes hand hygiene video developed by AA to show (original in English with Khmer simultaneous translation by a Khmer translator and facilitator) to participants, then followed by focus group discussion using semi-structured questionnaires with 45 Cambodian nurses and midwives, from six national hospitals in Phnom Penh and two provincial and district hospitals in Kampot and Kampong Thom provinces, which provided different levels of complementary packages activities (national level, CPA3 and CPA 2). Total 45 individuals: 27 nurses (15 male, 12 females) and 18 midwives(all female) were identified based on their availability, their convenience, their involvement in routine clinical works and their willingness to participate in the study. The main findings showed e-learning method is a suitable and acceptable approach as one of the CPD tools in Cambodia for a re-licensing system. In general, e-learning provided much more benefits (with the same effectiveness as traditional methods) to health workers, compared to traditional face to face training, including saving time (for travel), saving cost (for food, accommodation and cost that are related to their absence from workplace) and convenience (they can select time, place and pace for their study). Some participants were willing to pay to participate in e-learning programs. However, there are some barriers identified such as their low level of English proficiency, lack of high speed internet access, low level of computer skills and internet technology skills, posed challenges to the roll out of this method. For the specific hand hygiene e-learning video developed by AA, there are some complaints on the 60 minute length which seems too long, while some other complaints of the Western style and culture of the instructor in the video as well as their low English proficiency. 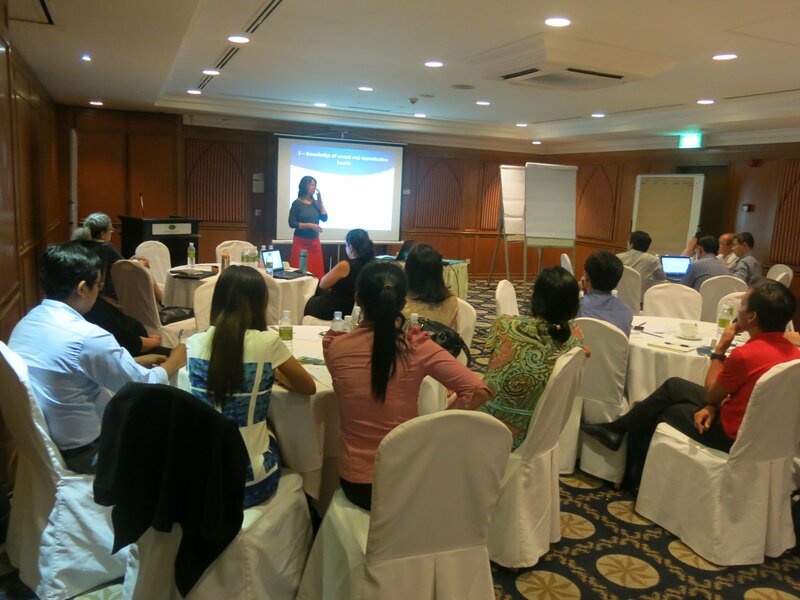 In summary, participants showed great interest in the AA e-learning approach as a potential training tool for CPD in Cambodia. However, low levels of English proficiency, limited experience with internet technology and lack of high speed internet outside Phnom Penh were seen as possible barriers to the successful introduction of E-learning in health setting in Cambodia. At minimum, the e-learning materials should be dubbed or subtitled into Khmer to ensure they are well understood by Cambodian audience. It was also noted that having a local TOT trainer at participating hospitals to provide technical support would facilitate the implementation of an e-learning approach. 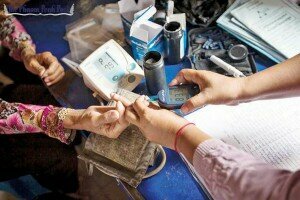 A woman has her blood sugar checked at a diabetes clinic in Phnom Penh. We are at a crossroads in Cambodia: cancer, cardiovascular diseases, diabetes and chronic respiratory diseases, the so-called ‘noncommunicable diseases’ (NCDs) are already the largest cause of mortality, and the rate is rising. They cause 61.3 percent of deaths but receive the least funding and attention across the board. People living with NCDs are also hit financially: they spend ten times as much on healthcare as those without NCDs. Clearly, huge action is needed to limit preventable deaths and work towards the goal of Universal Health Coverage (UHC). Against this backdrop, a major new financial contribution of US$4.5 million has been committed to strengthen and expand NCD services nationwide. The investment, by German bank KfW, is the largest single investment in NCDs. It also provides an opportunity to reflect on where we are, overall, in the NCD response, and examine how this investment fits into the bigger picture of what still needs to be done. NCDs impose a significant financial burden on households in Cambodia. For people living with an NCD, out-of-pocket expenditure on health accounts for about a third of their monthly income, compared to only 3 percent of income for people without an NCD. This results in catastrophic health expenditure. Efforts to achieve the UHC agenda – ensuring access to quality health services without financial hardship – are gaining some momentum in Cambodia, with clear policies to expand financial protection through social health protection schemes and reduce financial barriers to access. Addressing NCDs is a crucial part of delivering UHC, but without a balance between the upstream, multisectoral policies for prevention, and the downstream, health-sector interventions to improve access to quality health services, efforts will have limited success. 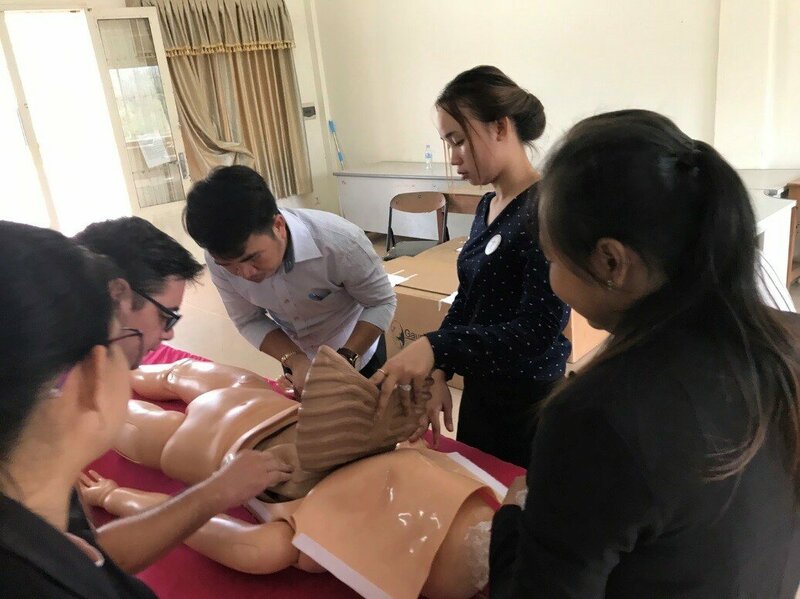 GIZ Cambodia’s Social Health Protection Program is a key partner in the NCD response, providing financial and technical support to the Ministry of Health’s Preventive Medicine Department (PMD). PMD have established basic screening and treatment services for hypertension and diabetes in a small number of health centers, based on the WHO Package of Essential NCD services (PEN). 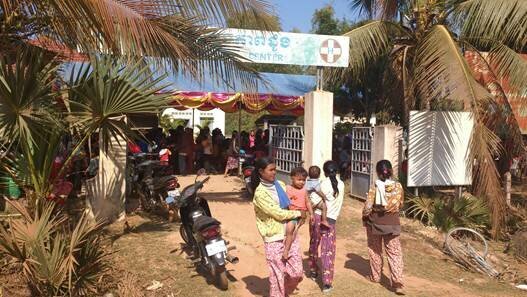 Financial support is provided by GIZ to implement PEN in 11 health centers in Kampong Thom and Kampot provinces. Since 2007, 26 NCD clinics have also been established, at district and provincial referral hospitals, to treat more complicated cases. 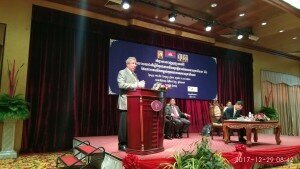 However, these services are currently not adequate for the scale of the burden in Cambodia. The US$4.5 million, committed by KfW to the Cambodian Health Equity and Quality Improvement Project (H-EQIP) will support supply-side readiness and the availability of key NCD services, specifically cervical cancer, hypertension, and diabetes screening and treatment services. This funding is particularly significant considering the extremely small global NCD investment: a mere 1.3 percent of total Development Assistance for Health (DAH). Funding for NCDs is rare: globally NCDs account for 70 percent of health-related deaths but receive less than 1.3 percent of development assistance of global health budgets. This investment is an opportunity to build new momentum and commitment to NCDs in Cambodia. GIZ will continue to support the MOH’s Preventive Medicine Department, who will be the lead implementing body responsible for scaling up NCD services. NCD service delivery is also the focus of two further projects launching in 2018, funded by Novo Nordisk, in collaboration with GIZ and PMD. This includes a 3-year project ‘Changing Diabetes in Children’ (CDiC) and a 1-year project ‘Changing Diabetes in Adults’ (CDiA). CDiC aims to improve access to care for children and young people with type 1 diabetes and CDiA will strengthen the capacity and infrastructure of the existing NCD clinics. Other key developments this year include the endorsement of the Multisectoral Action Plan on NCDs by the Cambodian Prime Minister, setting the tone for a whole-of-government response; new data on the prevalence of NCD risk factors (STEPS Survey 2016); and joint UNDP-WHO NCD investment case, currently underway, which will provide the economic case for investing in the prevention and control of NCDs. Significant investment to strengthen services for those most at-risk is of course necessary, but simply treating our way out of the NCD epidemic is not an option. The new investments of 2018 should be celebrated and leveraged to build greater momentum for action. We are at a critical point. New alliances need to be formed, accountability strengthened, and the narratives must speak the language of decision-makers. Ultimately, a whole-of-government and whole-of-society approach is needed to reverse current trends. The Maternal & Newborn Care Project, implemented by GIZ on behalf of BMZ cooperated with GFA and the Liverpool School of Tropical Medicine (LSTM) in improving skills of health staff attending deliveries in public health facilities. 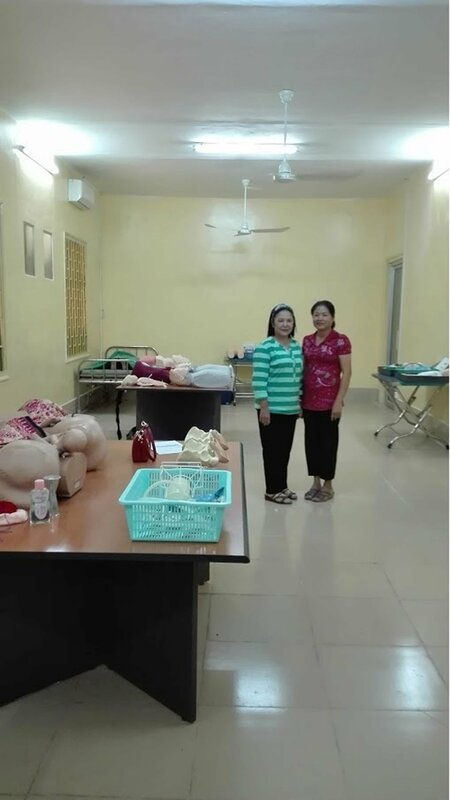 Three skills labs have been established in 2017 at the Provincial Referral Hospitals in Kampot, Kampong Speu and Kampong Thom with the aim of improving Emergency Obstetric and Newborn Care services provided by skilled attendants such as midwives and doctors. Setting up the skills labs and providing equipment was just the start. It involved discussions at national and provincial level, deciding how to renovate rooms and supervision of the renovations. This was followed by more discussions on how the skills labs would be used including access, keeping the rooms clean and tidy, identifying who would be in-charge of the skills labs and care of the training equipment. A more critical consideration has been how to encourage busy healthcare providers such as midwives and doctors and their managers to invest their time to use the skills labs. 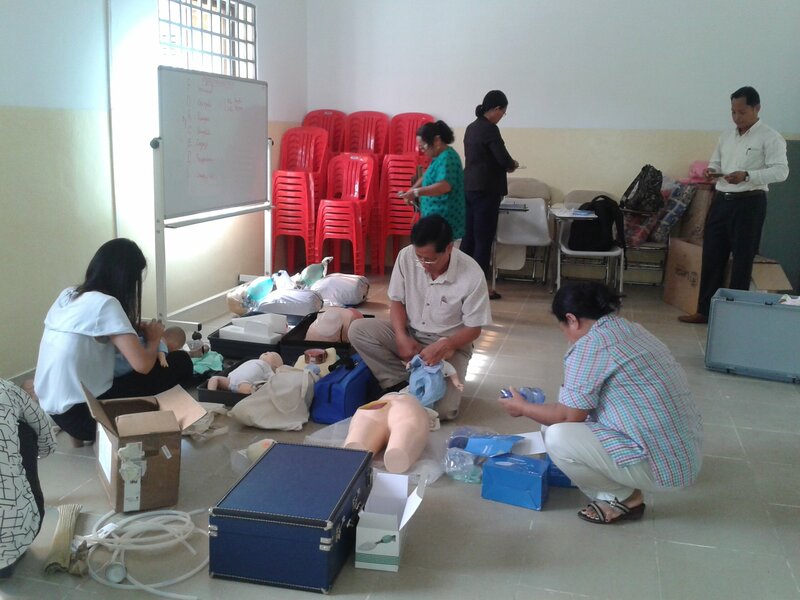 Therefore, it was decided to link the setting up of the skills lab with the provision of refresher EmONC trainings for all skilled attendants in the four GIZ supported provinces (Kep, Kampot, Kampong Thom and Kampong Speu) using the LSTM 3-day EmONC skills drills package. During the training, everyone had the opportunity to practice the skills drills. 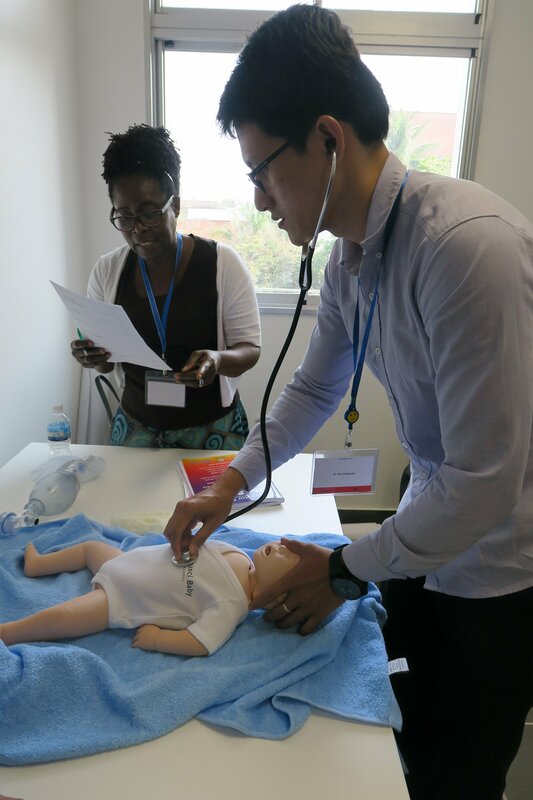 This included adult and neonatal resuscitation skills, the management of obstetric emergencies such as postpartum haemorrhage, eclampsia, sepsis and how to manage breech presentations and shoulder dystocia, using the identical equipment provided in the skills labs. All training materials were translated into Khmer and the training was delivered in Khmer with the assistance of translators who supported the UK trainers or by participants who had been selected as trainers. Everyone has been very excited about the trainings and say “It is the best training they have ever attended”Â. The skills labs are now being used by groups of students and midwives. Sessions are led by either project staff or hospital midwives. The next steps are to encourage all healthcare providers to use the skills labs, as well as to encourage groups to access the skills labs themselves in a non-formal manner. Operational research will be conducted to measure how the skills labs are used over a one-year period. Practical training is an important part of training students in nursing and midwifery. Before going on practical placement at hospitals and health centers and seeing the patients, students need to learn the clinical procedures. Nursing and midwifery trainings cannot be imagined without the clinical practical training because the profession has always been taught by the bed of the patient. 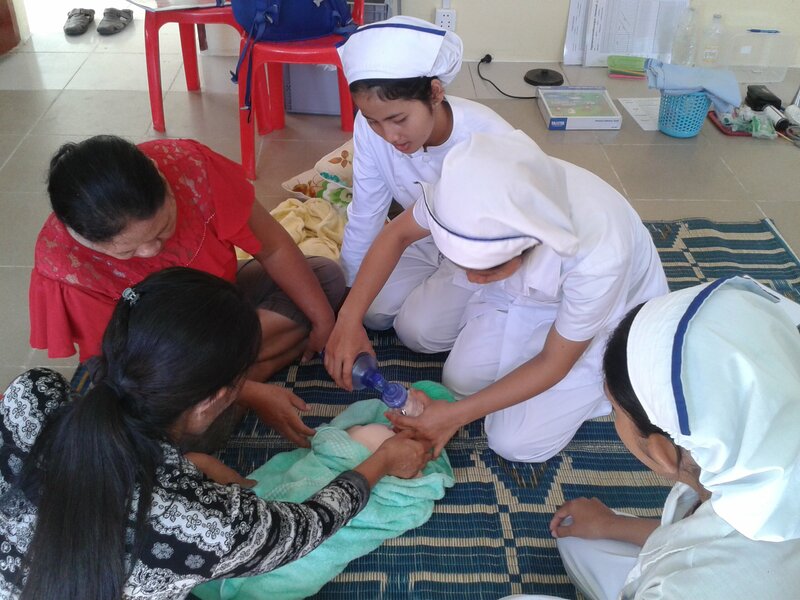 Currently, student nurses and midwifes are sometimes expected to learn these skills during their practical placements because at the Kampot Regional Training Centre (KpRTC) not enough materials are available to learn and practice the necessary skills. Learning clinical skills on ‘real patients’ not only jeopardizes a patient’s safety but also raises many ethical concerns. And as students undertake different placements, the amount and type of practical training they receive vary considerably. The GIZ Maternal & Newborn Care Project has supported KpRTC since December 2015 in order to improve the quality of pre-service health training. The project placed a development advisor and a local assistant at the KpRTC in order to provide technical support to capacity building for teachers, clinical instructors and students. 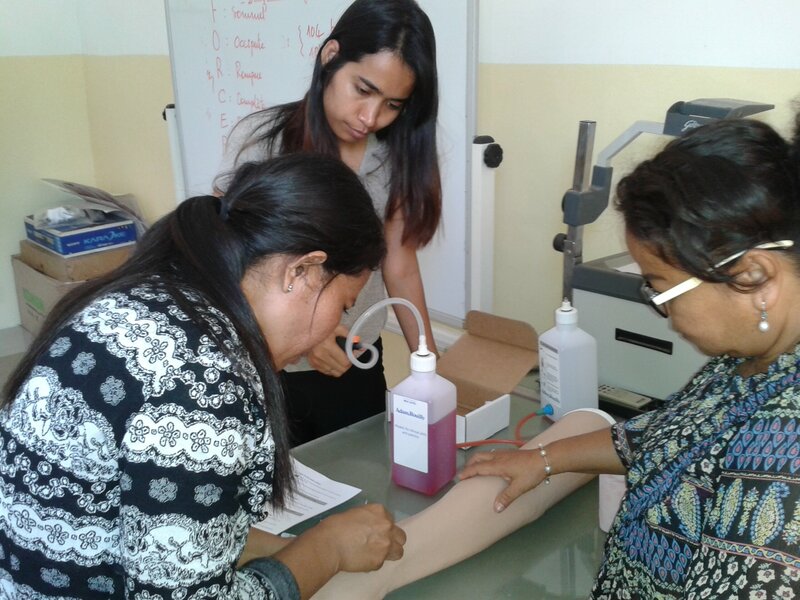 One of the most recent activities includes the procurement and training on high standard nursing and midwifery mannequins. These sets of mannequins will improve the clinical training with regard to multiple clinical procedures in an effective and scientific manner. 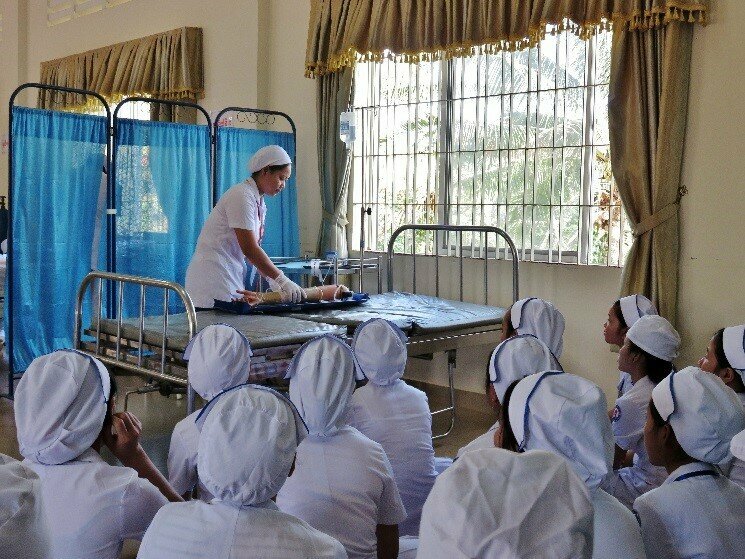 By improving the practical training at the KpRTC’s skills laboratory the project aims to improve the standard of education provided by the institution to future nurses and midwifes. Today, the skills laboratory at KpRTC is a steady established part of the KpRTC education offering the possibility of training clinical procedures in a safe and clean environment prior to real life application at bedside or in the operating room with the patients. This training follows a structured teaching concept. It takes place under supervision and in consideration of methodological concepts, creating an environment that allows the free practice of targeted skills and competences of midwifes and nurses. 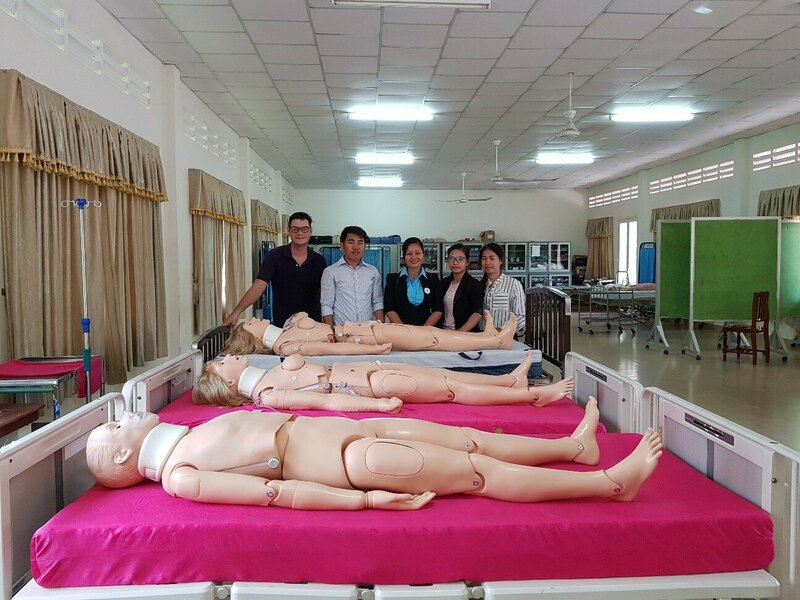 To make a bridge between practical learning at the skills lab and real life patient practice, GIZ also supports a peer learning approach at the Kampot provincial referral hospital where clinical instructors and preceptors work together to supervise and coach the students on the job. This method has been proven successful for improved skills learning as well for the students, preceptors and clinical instructors. Field and Nutrition Days– an efficient way to reach target groups! 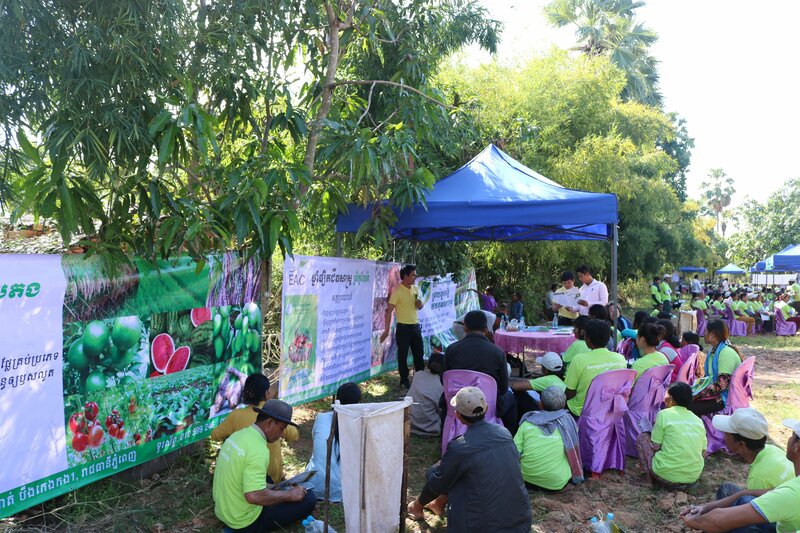 The first two Field and Nutrition Days of the project MUSEFO took place in the provinces of Kampot and Kampong Thom. More than 1.000 small-scale farmers and women in reproductive age could be reached and be informed about agricultural and health topics related to food and nutrition security in twelve different topic stations. The participants of the agriculture section got information about diversifying their nutrition and food production by building their capacity to grow a more diverse range of crops and small animal schemes in an organic way. Demonstrated were thereby themes like farm planning, home gardening, chicken raising and direct seeding, where also new agricultural tools were presented. At the same time the women in reproductive age become aware and get knowledge about a balanced diet for their small children and themselves especially during pregnancy and breastfeeding period and the importance of basic hygiene practices. Promoting nutrition counselling and growth monitoring through the nurses and midwifes of the health centers serve the improvement of health care, and cooking demonstrations show them how to prepare healthy and diversified food for the whole family. Innovative methods of direct seeding of mung bean were introduced as well as nutrition counselling for women and children under 2 years. Partners from ASEAN-SAS Project, the Eco Agro Center (EAC), explaining the positive impact of Trichoderma. To both groups a seed calendar, crop and recipe sheets were distributed to introduce an innovative tool creating and showing the important linkage between agriculture, nutrition and health. The science of a sustainable agriculture, organic crop production and ecological small scale animal raising set the course for a healthy and diversified food production and consumption. Retrospectively the efforts about organizing the “Field and Nutrition Days” were a big success and it remains to be hoped that the new acquired knowledge also will be applied. Through the prospective “Field and Nutrition Days” the target group of 25’000 women in reproductive age, 5’000 children under two years and 15’000 farmers in 200 villages will be reached to prevent food insecurity and increase living conditions in the provinces of Kampot and Kampong Thom. Older people make up an increasing proportion of the population in low- and middle-income countries. This brings a number of challenges, as their health requirements are greater than, and different from, those of younger people. In general, these health systems are not geared to address their needs, and traditional support systems tend to erode, potentially causing financial hardship when accessing health care. 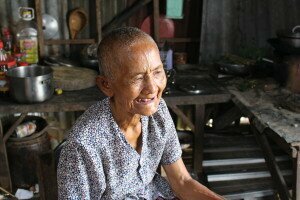 This paper provides an overview of older Cambodians’ financial access to health care over time, using nationally representative data to enable the formulation of appropriate responses. “We have the right to love but we do not dare to love”. This statement of a group of Cambodian women with disabilities illustrates that men and women with disabilities do not only face a number of barriers to marriage, they also fear rejection because of their impairments. Thus, sexual and reproductive health, rights and needs of persons with disabilities are invisible. In order to overcome the information gap and identify and address challenges, an evidence base is required to inform the implementation of disability inclusive sexual and reproductive health programmes. On Thursday the 12th of May 2016, Dr Alexandra Gartrell, Research Fellow from the Monash University in Melbourne, presented two studies in a workshop in Phnom Penh to representatives from organisations such as WHO, UNICEF, Reproductive Health Alliance Cambodia, Partnering to Save Lives Cambodia, Epic Arts and GIZ. Dr Gartrell’s research on disability and sexual and reproductive health and rights is the first study to specifically examine disability, sexual and reproductive health in Cambodia, and was conducted in four provinces; Kampot, Kep, Kampong Thom and Kampong Speu. Such research is vital as the sexual and reproductive health and rights of persons with disabilities have been deeply neglected in a historical pattern that includes denied information about sexual and reproductive health, denied rights to establish relationships, and the right to decide whether, when and with whom to have a family. 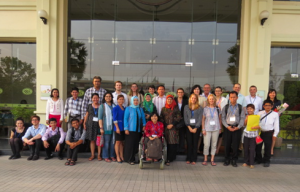 Dr Gartrell presented two studies, both jointly conducted with the Cambodian Disabled People’s Organisation and supported by the GIZ Maternal and Newborn Care project. The first is a qualitative study which explored key challenges persons with disabilities face in accessing sexual and reproductive health services. Dr Gartrell found that disability shapes women and men with disabilities’ sexual and reproductive lives, and that for rural women in Cambodia, disability fundamentally reduces women’s potential to marry, bear children and acquire the socio-economic security of marriage. Additionally, women face challenges in the culturally-based stigma that exposes women with disabilities to greater rates of physical, verbal and sexual abuse than their able-bodied counterparts. Dr Gartrell also found that persons with disabilities’ knowledge of contraception and reproduction is limited, affected by the overall low levels of education among people with disabilities, the poor quality of education in Cambodia generally, and marital status. Dr Gartrell emphasized to the audience that the provision of appropriate, practical and emotional support by health professionals, teachers, families and community members need to be promoted to overcome these barriers. Based on the foundational insights of this qualitative study, the second study Dr Gartrell presented is a quantitative one defining baseline values to inform GIZ Muskoka project targets. Dr Gartrell found that the sexual and reproductive lives of persons with disabilities differ in terms of their knowledge, practices, and access to information and services, and that these differences are significantly influenced by gender, impairment type, and education level. As for knowledge of sexual and reproductive health, Dr Gartrell reports that age, education and socio-economic status and membership to self-help groups influence this. Yet greater knowledge of sexual and reproductive health does not result in respective behaviour and is not sufficient to increase access to health services. Dr Gartrell recommends involvement of family members to increase health service utilisation. Supportive parents and spouses are critical facilitators of persons with disabilities access to health services. Advocacy to promote recognition among these key supporters that persons with disabilities have the same reproductive health needs is required. An active workshop discussion centered on women’s view on contraception, how to provide reproductive health information to persons with disabilities in an accessible manner, and the possible role self-help groups and other organisations of persons with disabilities can play in this area. Attendees of the event discussed the need for linking initiatives on reproductive health communication and disability rights awareness. 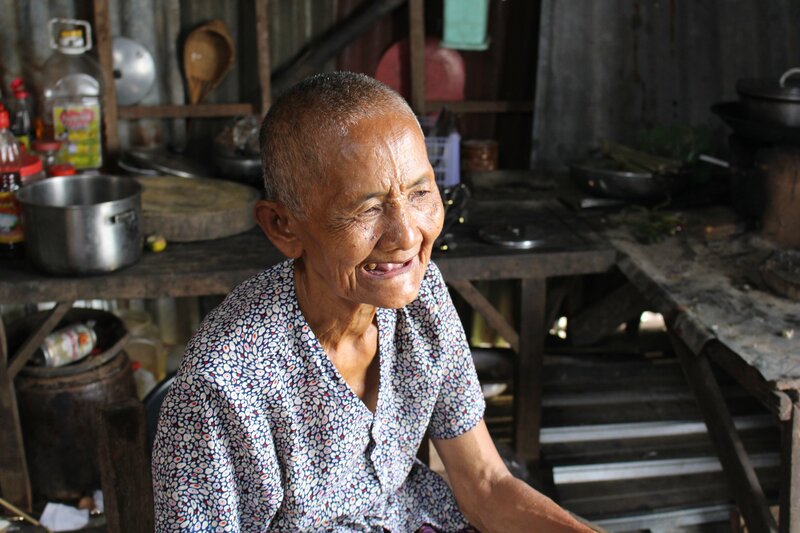 Preikuy commune, Kampong Svay district, February 2015 – In Kampong Svay, a local initiative has created a new and innovative way to support the poorest and the most vulnerable members of the community: persons with disabilities and older persons. During a money flower ceremony at Bendei pagoda $3,289 were donated by the community to enable those in need to visit a doctor when falling ill. The money was then donated to finance moto dubs, which are contracted, to bring the most vulnerable people from their home to a health centre. This basic service could be a matter of life or death for many that cannot afford the transport to get to health centres. The initiative was jointly started by the local government and religious authorities and facilitated by GIZ. “The poor have problems taking care of their health in this remote area,” said Venerable Khim Sopherum, Abbot of Vihear Khpos Pagoda. 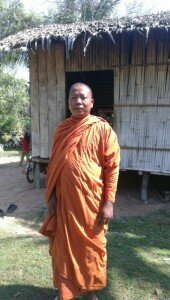 Venerable Sopherum leads the Pagoda Fund Committee that supports fundraising in 64 pagodas in Kampong Thom province for charitable purposes. It was his idea to conduct the money flower ceremony and donate the money to finance transportation. His aim is to establish closer links between temples and society and to support the poor and vulnerable. “The ceremony offers wealthier families the chance to share their happiness and make merit,” says Venerable Sopherum. To promote the money flower ceremony, an advertisement was placed on a Dharma radio programme, which is run by monks as well as local radio broadcasts. Additionally, flyers were distributed to all 64 temples supporting the ceremony. Venerable Samret Naing was very proud that his pagoda hosted the ceremony. He generously provided free breakfast and lunch for monks joining the ceremony as well as water and soft drinks for guests. To attract young people, a theatre group from a local school for teachers performed and a camera man recorded the best moments. During the money flower ceremony 10 monks provided dharma preaching. Strengthening the collaboration between local authorities and pagodas for the greater good is an important aim for GIZ Cambodia’s Social Health Protection Project. In 2014, the project team encouraged pagodas to reactivate the support for transportation and conduct fundraising for this purpose, since the local Health Equity Funds does not cover those costs. Due to financial reasons, it was agreed that only the poorest and vulnerable persons should benefit from this activity. So far, the communes of Meanchey, Kdei Dong and Tbong Krapeu cooperate with pagodas to support transport for persons with disabilities and older persons. It is remarkable that governmental and religious representatives work together. “GIZ’s Social Health Protection team advises us on affective fundraising,” said Heurn Yinthy, official from Kampong Thom’s Department for Religion and Cults. With project support, daily fundraising has increased and additional activities, such as the money flower ceremony, were conducted. Additionally, the team provides advice to local authorities on managing and organizing transportation. Venerable Sopherum reported that he would like to intensify collaboration between GIZ’s Social Health Protection team and Mr. Keang Sengky, Chief of the Association of Municipal, District. “Cooperation between stakeholders has improved thanks to the Social Health Protection team’s support,” said Venerable Sopherum. 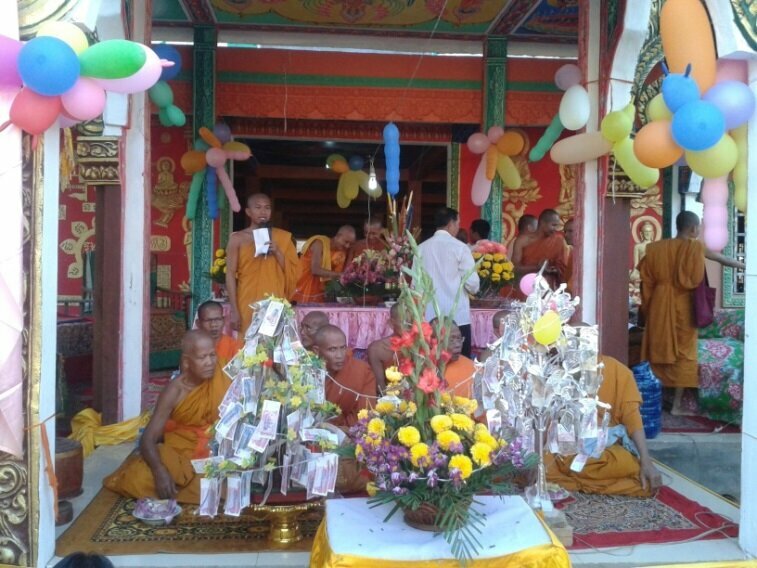 Representatives from the Association of Municipal, District, and Commune Sangkat Councils (AMDCSC), the Kampong Svay district office, the department for religion and cult, and the Pagoda Fund Committee, as well as some pagoda cluster chiefs are members of the money flower ceremony committee. 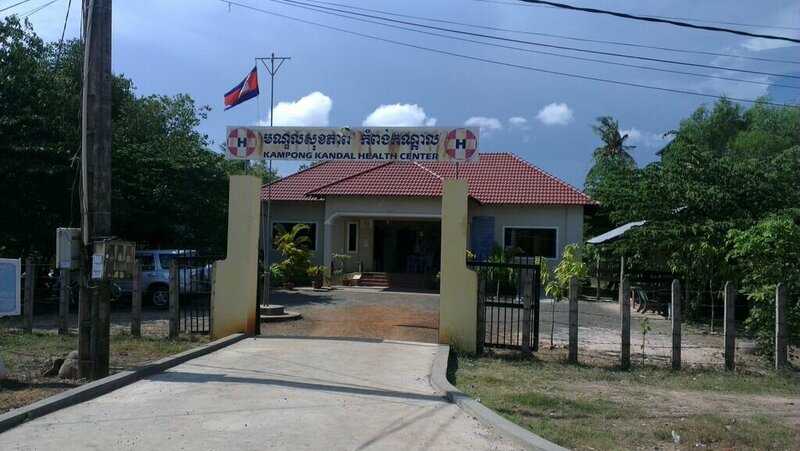 Kampong Kandal, Cambodia, January, 2016 – In Cambodia, community participation in health care services is paying off. A nationwide roll-out of Health Centre Management Committees (HCMC) are strengthening local governance and enhancing community participation in the health sector, Communities are now getting involved with the co-management of facilities and exchange of information among citizens, health care providers and local authorities leading to improved accountability and transparency, more efficient services and stronger leadership. Communities surrounding the health centre are experiencing improvements including funds allocated to their local commune budget, improved opening hours of health centre and patient-doctor relationships and more health education outreach and activities contributing to improved health centre hygiene. Health centre infrastructure has also improved including a wheel-chair accessible ramp, waiting room, and suggestion boxes. The most recent Client Satisfaction Survey conducted in 2015 showed that patients treated in the health centre of Kampong Kandal were satisfied with the health services. 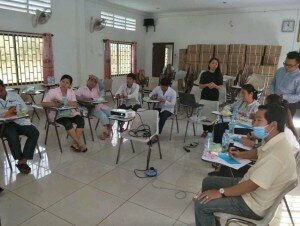 Health System Governance teams provide technical advice to HCMCs in the province of Kampot, which is one of the project’s target provinces. 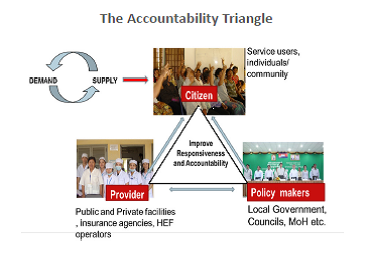 The underlying approach to Health System Governance aims to enhance interactions between citizens, health providers and local authorities or policymakers (see Figure 1), improving health system governance at the sub-national level. In 2012, one of the first HCMCs received support by the Health Service Governance team in Kampong Kandal commune. This committee was chosen in early 2012, since the members were struggling to fulfill their roles and responsibilities. The Health System Governance team provides technical advice and facilitates committee meetings, which take place every second month. 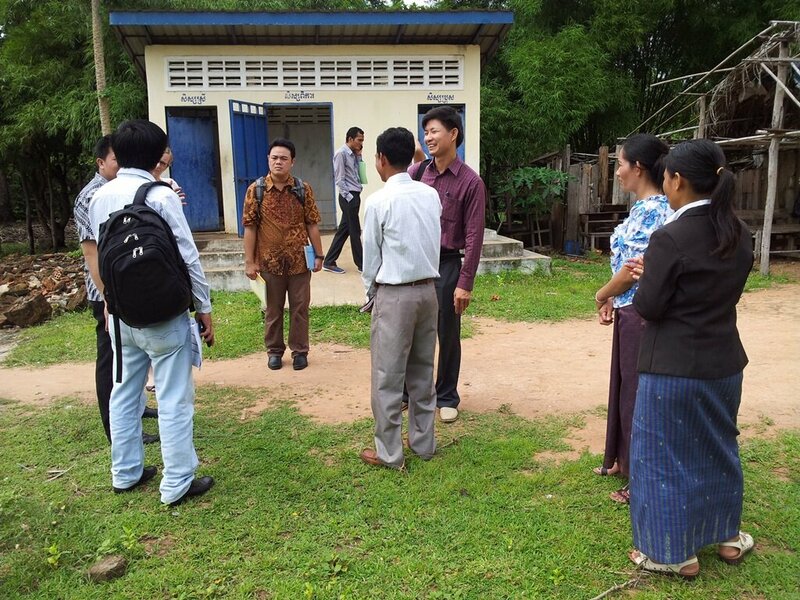 During the meetings, the team’s advisor Mr. Por Pen, assists in monitoring the performance of the health centre of Kampong Kandal and the implementation of agreed activities. He also ensures that feedback from patients is taken into consideration. Additionally, the Health System Governance team organises regular workshops and trainings to equip HCMC members with essential skills and knowledge. Governance teams provide training on how to interpret client satisfaction survey findings; client and provider rights and duties; and on-the-job training on how to manage HCMC meetings. What are Health Centre Management Committees (HCMC)? HCMCs aim to improve the scope and quality of services in health centres. Health centre staff are part of the committee as well as the chief and members of the commune council and members of the Village Health Support Group, who represent citizen’s interests. The main role of HCMCs is to provide direction and guidance for health centres to ensure that services are available, accessible and utilized. 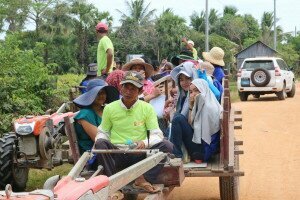 The work of the HCMC Kampong Kandal is now more efficient, since members know what is expected from them and they are aware of their rights and duties. It has been reported that communication and collaboration among citizens, health centre staff and the commune council have improved considerably. In general, all groups are now more actively involved in HCMC meetings, the planning processes for the health centre and the commune council, and reflection forums. Kampong Thom, July 2015 – Yort Norng was living with her eight children and her husband, a soldier and the village chief of Samrong, Preah Damrei commune in a rural area in Kampong Thom. In 1986, her life drastically changed when her husband died. Norng is highly motivated to improve the life of the villagers in Samrong village, “I really wanted to help my community,” she said enthusiastically. Soon after this tragic event, her community chose her as the new village chief of Samrong, as they valued her strong engagement with the community. Norng continued to serve her village as leader for 26 years before she was elected in 2012 as commune chief for her district in Preah Damer, Kampong Thom. As commune council chief, Norng assumes the highest responsibility in her district. She is eager to full the expectations of her community. Norng recalls the risk one took to be politically engaged at that point in Cambodia’s history, “I put the list with the names of the committee members in a bamboo pole, to protect the paper, and buried it in my garden, as it was dangerous to be a committee member”. With only a secondary school education, Norng is trained in sewing. It was not until later in her life that she assumed the responsibility as village chief. 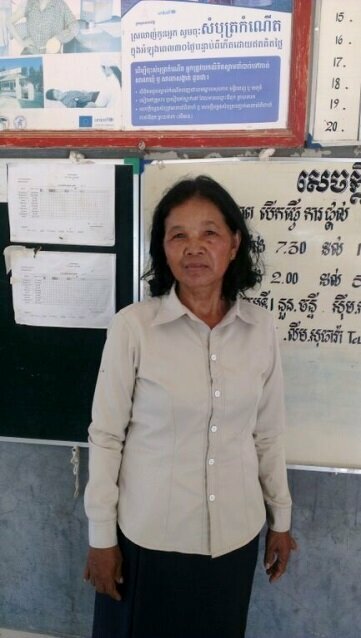 In addition to her current role as commune council chief, Norng is a member of several committees in the commune of Preah Damer including the Red Cross, Association Health and Rights and is a member of the Health Center Management Committee. Additionally, Norng is a member of the Health Centre Management Committee (HCMC), supported by GIZ’s Social Health Protection Project. The overall aim of the HCMC is to improve the cooperation between citizens, health staff and government staff in order to improve health services provided by health centres. She uses her longstanding experience to facilitate this cooperation. Improving health and well-being of citizens’ living in her commune is one of her overarching objectives. In 1995 a friend recommend that Norng contact the GIZ – then GTZ, to learn more about their rural development programmes. The same GTZ that eventually supported her village provided financial support to the Cash and Rice Association and provided technical advice for the elections of the Cash and Rice Association Committee. Her initial contact with the GTZ was the start of a longstanding collaboration between her and the local GIZ team. Norng participated in many GTZ/GIZ trainings to improve her leadership skills and apply her knowledge for the greater good of her village and later also for her commune. She is very grateful that she received support from GTZ/GIZ, as it helped her gain confidence for her political position. Health as a human right is our entry point. Health care and social protection for Cambodians has improved during the last decade; but challenges still lie ahead in accessing quality health services. Top on the list of areas to improve include maternal and newborn mortality as well as infectious and non-communicable diseases, which remain a daunting reality for many people. The Cambodian-German Social Health Protection Programme supports the Royal Government of Cambodia to improve the quality of and access to health services mainly for vulnerable people and those living in poverty, using a multi-level approach of policy advice and practical implementation. Our efforts closely align with the Ministry of Health’s Strategic Plan and strengthen the capacity of national and sub-national institutions to protect the health of women, men, young people, children and the elderly. Social health protection programmes enable people to access health care when needed without the risk of impoverishment or other financial burden. With our contributions, we lay the foundations for a comprehensive social health protection system linked to systematic quality improvement in health care. We assist with the design of national strategies, clinical guidelines and tools to promote sexual and reproductive health, patients’ rights and clients’ satisfaction and apply a mainstreaming approach to ensure responsive services to women and people from disadvantaged groups, such as the elderly and people with disabilities. 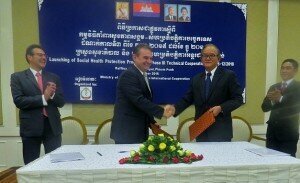 Germany further supports the Fast Track Initiative of the Cambodian Government to improve maternal and newborn health. Vouchers improve access to family planning and pre-and post-natal health services, and promote reproductive health at the community level. Nurses, midwives and doctors are capacitated to provide quality services in our target areas. Our joint efforts address critical gaps in emergency obstetric care, family planning and sexual and reproductive health, which are vital areas for improving women’s rights. For more information about health and social protection please visit the Healthy DEvelopments Portal of the German Federal Ministry for Economic Cooperation and Development (BMZ). 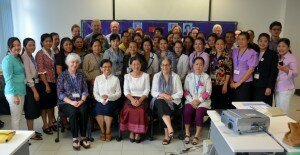 GIZ works towards the inclusion of persons with disabilities in the health sector in Cambodia. We are proud to present the experiences and lessons learned from the GIZ Social Health Protection Programme. 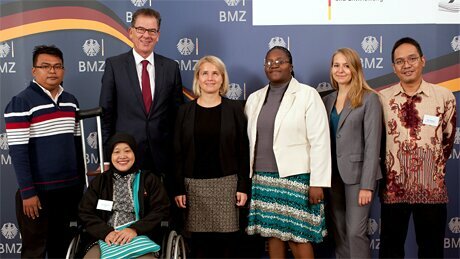 The case study has been selected by the German Federal Ministry for Economic Cooperation and Development (BMZ) due to its novelty and importance in light of the BMZ Action Plan for the Inclusion of Persons with Disabilities. It documents and critically reflects the early experiences of an important new approach. improving access to health for vulnerable groups. The workshop was opened by GIZ Country Director, Mr Adelbert Eberhardt, who stressed health as a key area in the German-Cambodian cooperation. 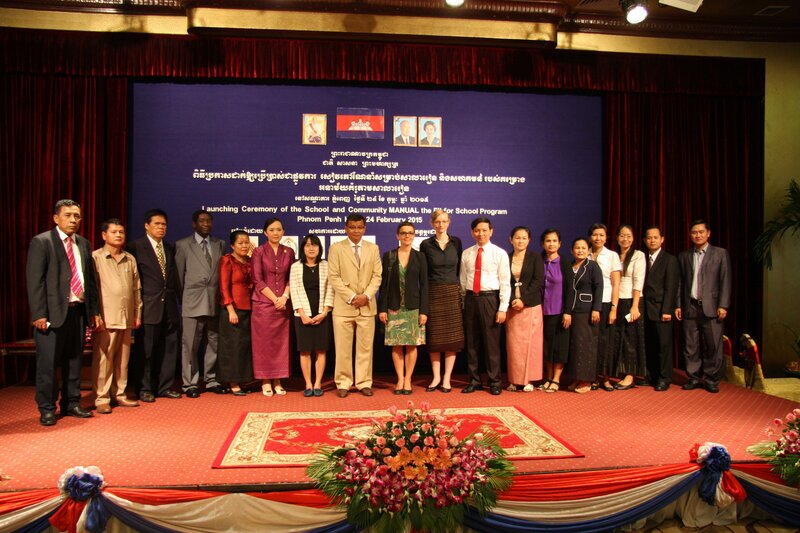 GIZ has been supporting the Royal Government of Cambodia since 1995 in the area of health. H.E Prof. Eng Huot, Secretary of State, of the Ministry of Health opened his speech stating “this joint launching ceremony is an expression of the profound relations between the Cambodian and German people and their Governments, based on mutual friendship, and of our earnest and high-spirited cooperation for the best of the Cambodian people”. Dr. Bernd Schramm, project director of SHP, provided an overview of the new project, followed by presentations for each output area. The participants discussed the best ways to achieve the presented results of the project. The successful workshop ended with H.E Prof. Eng Huot and Mr Adelbert Eberhardt signing the new implementation agreement for SHP III. The Regional Fit for School Programme in Cambodia aims to prevent infectious diseases among public primary school students to improve school attendance through three simple and low-cost interventions: 1) daily hand washing with soap; 2) daily tooth brushing with fluoride toothpaste; and 3) bi-annual deworming. 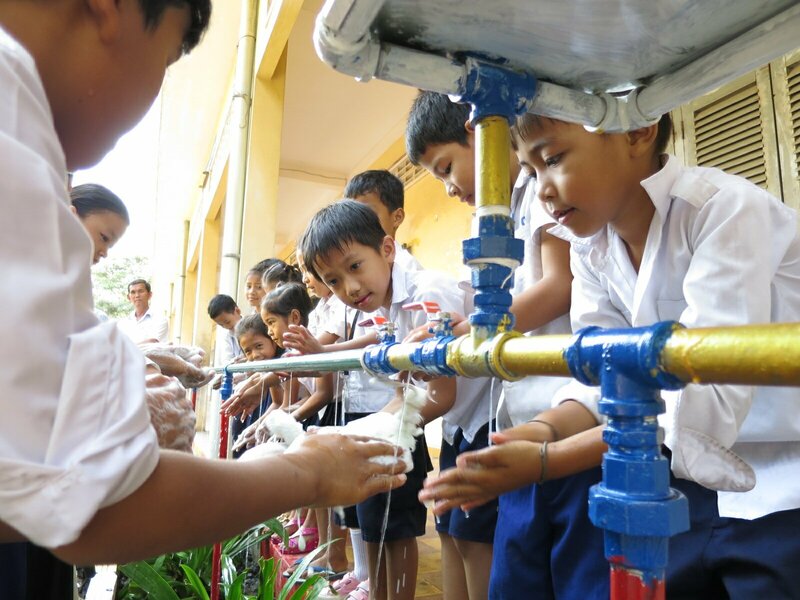 In July 2015, as part of the collaboration with UNICEF to expand the Fit for School Programme to more primary schools in Cambodia, 58 group washing facilities have been installed in 6 Primary Schools in Phnom Penh. The group washing facility enables students to conduct daily hand washing and tooth brushing in group when they are at school, using less water and time than conventional washing facilities. The group washing facility was designed by GIZ Fit for School Programme as part of the technical assistance to local partners in finding solution for a low-cost washing facility that can be produced in scale and ensures functionality. 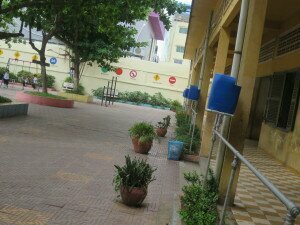 The facility, which can accommodate up to 22 children at a time, is prefabricated by Don BoscoTechnical School in Phnom Penh. Schools and communities ownership are encouraged by their involvement in choosing locations to install the group washing facilities, and the enhancements of the facilities by painting or adding flower/gravel bed to absorb water or adding a roof to provide shade for children. The enhancements are optional and based on school preferences and available resources. To date, over 1,000 of group washing facilities have been prefabricated in collaboration with UNICEF. Such facilities will be installed in140 more target primary schools this year in Takeo, Kampot, Kampong Thom and Kampong Chhnang Provinces. 53,000 school children will be covered and benefit from these installations. The expansion with UNICEF in the second round will cover 43,000 more children to reach out to a total number of 100,000 children by early 2016. 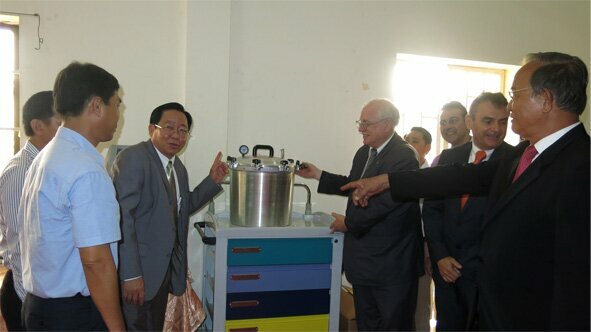 The facilities are also being installed in Laos and the Philippines. Phnom Penh, 21 March 2015. “Economic progress in the region in many cases lacks an enabling environment fostering the inclusion of persons with disabilities”, Mr Adelbert Eberhardt, Country Director of GIZ Cambodia opened the workshop titled ‘Bridging the gap between policy and practice – cross-sectoral innovations on economic inclusion of persons with disabilities’. More than 30 experts from seven Asian countries came together in Phnom Penh from March 18-20 to discuss experiences and innovative approaches towards economic inclusion. For the first time, GIZ invited colleagues, partners and international experts to discuss the topic from a cross-sectoral perspective and to identify areas for intersectoral cooperation in the region. “Collaborative partnerships are a key driver for a change process towards inclusion”, His Excellency Mr Em Cham Makara, Secretary General of the Disability Action Council in Cambodia, pointed out in his opening speech. This was taken up by Mr Patrik Andersson, Chief of the Social Integration Section at UNESCAP, who set the regional and thematic frame of the workshop. Health, social protection, vocational training and employment are essential sectors for strengthening the economic inclusion of persons with disabilities. Yet, access to these sectors and specific services remains limited due to prevailing stigma and discrimination. Participants shared the view that it is the exclusion of persons with disabilities which causes substantial costs for economies and leaves economic and social potential unused. Based on the BMZ Action Plan on the Inclusion of Persons with Disabilities, Ingar Duering, Head of the GIZ Sector Initiative “Inclusion of Persons with Disabilities”, provided the participants with an overview of the current approach and related activities of German Development Cooperation. She emphasised that inclusion is a process that requires perseverance and joint efforts to guarantee sustainability. Mr Hay Hunleng, representative of the National Employment Agency in Cambodia outlined current efforts in designing and offering matching services. Amongst others, a new job data base and support in recruitment processes aim to improve labour market access for persons with disabilities. Following intensive and fruitful debates in sectoral working groups, participants discussed cross-sectoral approaches and future directions for the economic inclusion of persons with disabilities in a market place. At the end of the workshop, lively exchange among experts from different sectors has created a first platform for the promotion of comprehensive inclusive approaches in GIZ’s partner countries. In order to enable further discussion and joint learning, similar exchange formats will be taken up in virtual technical forums in the future. 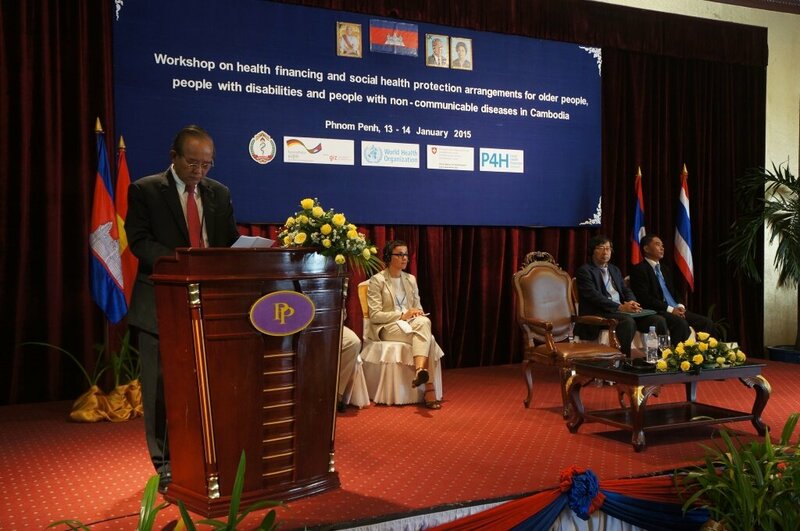 On 13 and 14 January, 2015, the regional workshop on health financing and social health protection arrangements for vulnerable groups such as older persons, persons with disabilities and persons with non-communicable diseases (NCDs) took place at the Phnom Penh Hotel . 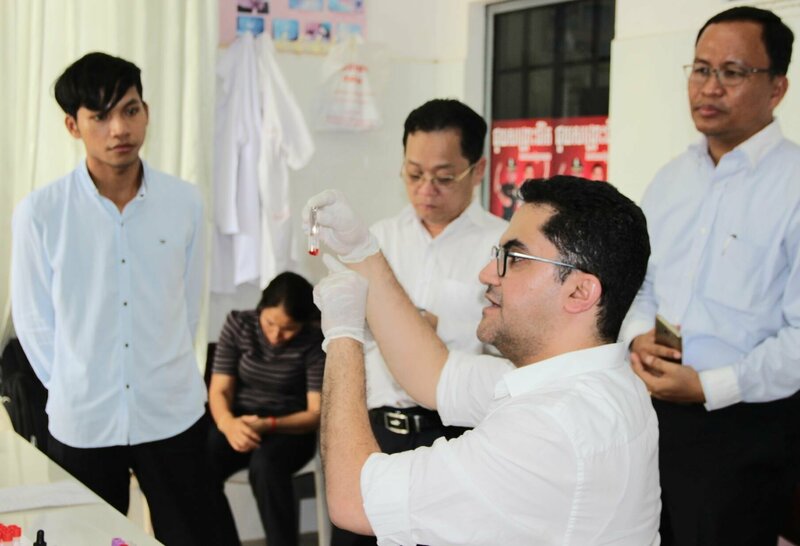 It was hosted by the P4H initiative and jointly organized by the World Health Organization (WHO) and the Deutsche Gesellschaft für Internationale Zusammenarbeit (GIZ), in collaboration with the Cambodian Ministry of Health. The event was focused on the lower Mekong sub-region, including Thailand, Vietnam, Laos and Cambodia. Representatives from several ministries of Cambodia participated including Economy and Finance; Interior: Education; Health; Labour; Social Affairs; and Public Functions. 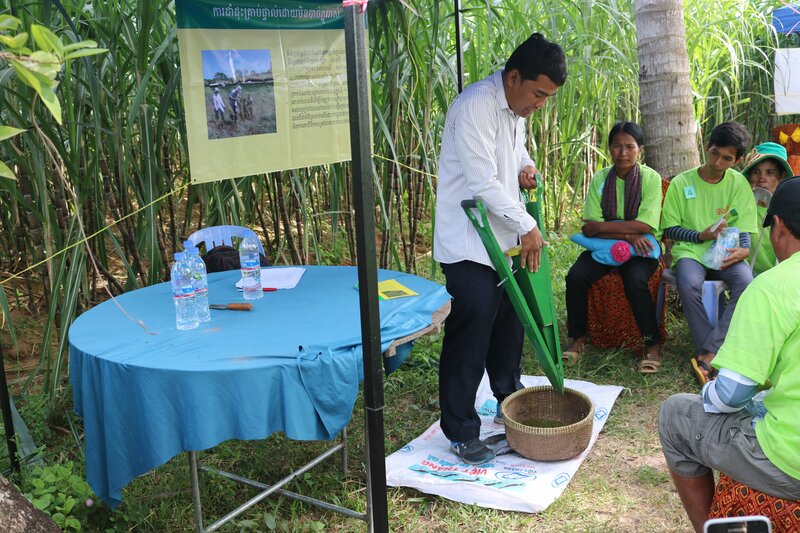 Other Cambodian participants included representatives from the Council for Agriculture and Rural Development, the Supreme National Economic Council, provincial health departments, civil society organisations and international development partners. finding ways to raise additional earmarked funding, for instance taxes or sin taxes, as a source of revenue for health promotion and eventually provision of specific health services for older persons, persons with disabilities and NCDs. Specific interventions considered helpful for enabling financial access to health care for vulnerable groups, are health equity funds (HEFs) and the IDPoor programme. However, the supply side should be able to render the required services for this access to be effective. In general, the Cambodian Government is committed to ensuring affordable access to health care for its population. However, the health system has to deal with several challenges such as the increasing number of vulnerable persons, while resources are constrained. The number of persons aged 60 years or more will increase from 1.1 million in 2013 to 2 million in 2030 and there is a considerable overlap between age and NCDs as well as disabilities. Depending on the screening tool, it is estimated that at least 4.3% of the Cambodian population lives with a disability. Based on international experience, the WHO expects this number to be closer to 10 – 15%. As the likelihood of becoming disabled increases with old age, this number is likely to rise. Vulnerable population groups have higher needs for health care, resulting in a higher chance of catastrophic spending and impoverishing health expenses. Their health spending is considerably higher than of other Cambodians: 3-fold among older persons, 5-fold for persons with disabilities, and 16 times higher for persons with chronic diseases. Moreover, they have limited access to health services. For this reason, there is a need to carefully consider the distribution of available resources in order to increase efficiency and use resources most reasonably. Phnom Penh – GIZ, in collaboration with School Health Department of Ministry of Education Youth and Sports launched the School and Community Manual and Video for the Fit for School Programme, aiming to improve sanitation and hygiene in schools throughout Cambodia. The materials are human capacity development tools that will be used to train school teachers and communities to implement the Fit for School Program in their schools. These three health precautions have been implemented in public primary schools to improve the school children’s health and academic performance. The launch was attended by several high-ranking officials including the Minister, Secretary and Under Secretary of State of Ministry of Education Youth and Sport, Center Director of SEAMEO INNOTECH Philippines, First Secretary of the German Embassy of Cambodia, and representatives from the Department of Health Prevention of the Ministry of Health, Department of Rural Health Care of the Ministry of Rural Development, and the Department of National Committee for Sub-national Democratic Development of Ministry of Interior. Twenty-five representatives from provincial and district office of education and school director and community members from the programme’s 10 model schools also attended. Mrs. Sophy, the village health volunteer, explains pregnancy to women in her village. 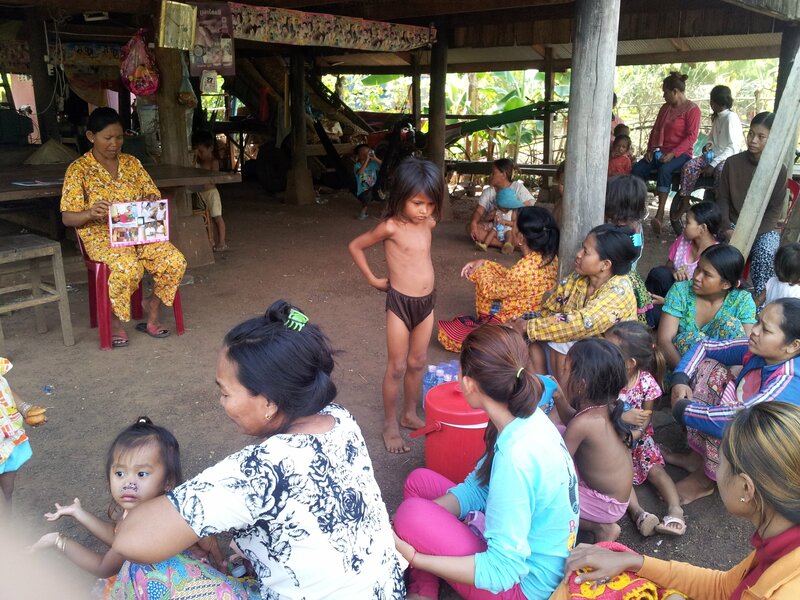 Kampong Thom, Cambodia, 2 September 2014 – In the remote Cambodian village of Porproak, mothers and pregnant women sit quietly on the ground under a wooden house listening intently at a session organised by village health volunteer, Mrs. Sophy. On a chair in front of the group she holds up pictures and explains what antenatal care services are, and how to prepare for birth. When she asks what the women learned from the session, it is amazing to see her audience enthusiastically engage with each other to provide the answers. 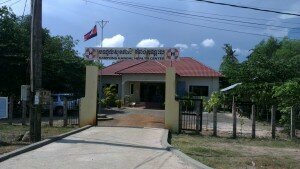 Porproak is a hard-to-reach village in Kampong Thom province, three kilometres from Protaong health centre and 78 kilometres from the provincial town. Most families in this medium-sized village of 516 people are farmers. In remote villages like Porproak, only about one-third of pregnant women receive antenatal care services and only one-quarter give birth at health facilities. Therefore, to ensure that women receive adequate antenatal care UNICEF – with funding from the Gesellschaft für Internationale Zusammenarbeit (GIZ) GmbH – has supported the training of volunteers in ‘community care for mothers and newborns.’ Mrs. Sophy (50) received her training in 2013. The training provides village health volunteers with counselling skills as well as knowledge and information on the types of health services women should receive during pregnancy. Mrs. Sophy with a pregnant woman in her village. They learn how to identify common danger signs during pregnancy so that women seek health services without delay. With this knowledge, Mrs. Sophy conducts home visits as soon as she knows that a woman in the community is pregnant. Home visits give the health volunteer an opportunity to involve family members in supporting a woman during her pregnancy. Mrs. Sophy said, “I am happy with my work to help the families in my village. I know that it is hard for me but when I see they have gained knowledge about how to take care of pregnancy and prepare for birth, I feel more encouraged to do my volunteer work. A pregnant woman discusses her heath with the village health volunteer at Protaong Health Centre. “I always take my free time to see families at home, especially the poor ones; to explain to them what health services a woman should receive during pregnancy and how to prepare for birth,” she said. “I also help poor families to access commune budgets or health equity funds. I see changes in my village in the last one or two years after women and their families have more knowledge about pregnancy and birth,” said Mrs. Sophy. “I also noticed that the health centre has more equipment. More women from my village go to the health centre for pregnancy checks and give birth there,” she said. Although there are still many pregnant women who do not receive antenatal care services and continue to give birth at home, the Protoang Health Centre report shows an increasing trend in service delivery coverage after village health volunteers were trained in ‘community care for mothers and newborns’ and the health centre received additional equipment thanks to the German Government and GIZ. When Ms Sun Phany, a 24 year-old and newly graduated primary midwife started working at Chey Health Centre in 2009, she experienced challenges like many other midwifes all around rural Cambodia. Gaining the trust and acceptance of the community and particularly pregnant women is a long process that takes time, effort and commitment. They have to compete with Traditional Birth Attendants (TBAs) and people’s deep-rooted distrust in the health system, due its low quality and unreliability. 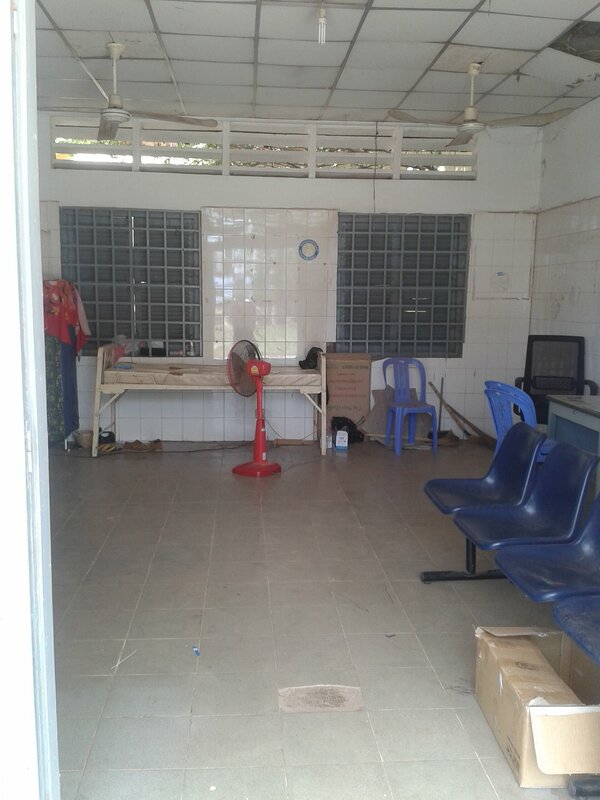 Chey Health Centre was quite typical for rural Cambodia; it was poor and remote, the infrastructure and hygiene inadequate, services and equipment were of low quality. Accessing public basic health services was a challenge for most villagers, due to poverty or the long distance to travel to reach the facility. Moreover, if they sought services, there was often no staff to attend to their needs. Hence, utilization of health services was low in the community. At Chey Health Centre, the roof was damaged, the rooms needed renovation and the road leading to the village was of poor condition. In 2010, there were only 5 people working at the health centre, 1 midwife, 3 primary nurses and 1 worker (non-technical); hence, deliveries in the community were mainly attended by TBAs. Most patients at the health centre were pregnant or suffered of diarrhoea, acute respiratory infections, and malaria. In 2010, the provincial health advisor of Social Health Protection Programme (SHPP) passed by Chey health centre and met Ms Sun Phany. It was about 7.30 am and she was helping a woman through delivery since 4 am. The baby girl was delivered safely and the mother’s relatives were grateful and relieved. However, Phany’s shift continued as she had to clean the delivery room, washing it with a small bucket of water and prepare it for the next delivery. 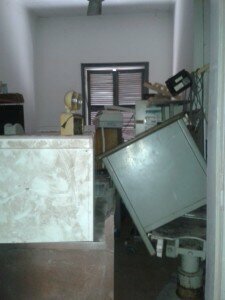 The room had no light; it was dirty and lacked basic equipment. After a meeting of GIZ staff with the health centre chief and Phany, it was jointly decided to improve the quality of the health centre by implementing Quality Improvement (QI) tools. The quality assessment base-line score was 44% in 2010. Based on the assessment, a QI plan was developed with the health centre team and the Provincial Health Department. 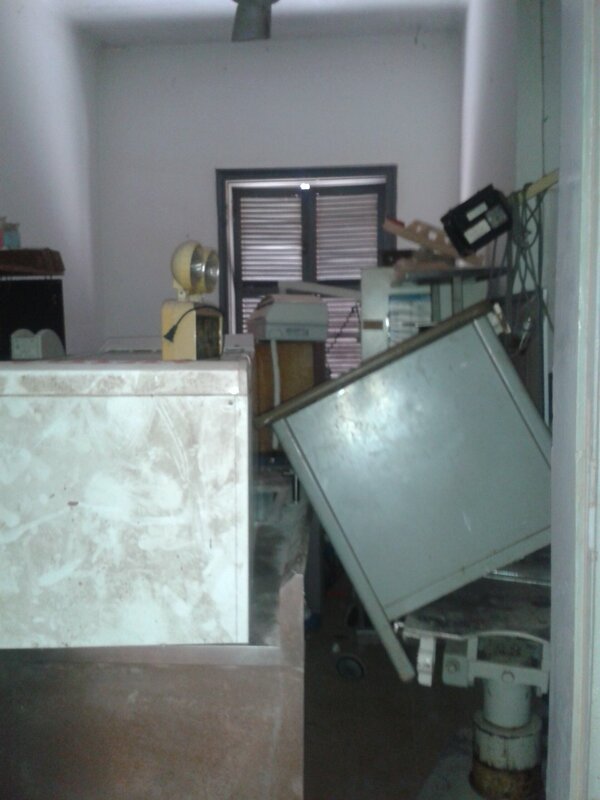 Resources were mobilized, not only from the SHPP, but also from CARITAS, to improve the health centre’s infrastructure. The roof and rooms were renovated, a water supply system and sanitary facilities were set up and solar panels and batteries were installed. 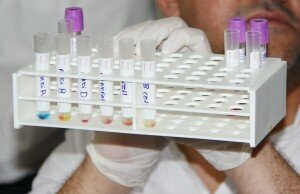 Staff was trained to use the Health Center Quality Assessment Tool and other QI measures. The SHPP focused mainly on supporting the delivery services through on the job training by a development advisor as well as renovating the delivery room and purchasing better equipment. In 2014, the QI assessment score was 93%, a clear improvement compared to initially 44% in 2010. Phany has contributed a lot to this development. She became a very active member of the health centre team and clearly made a difference in the maternal and child health service. She is well known and respected by the community she serves. One village chief said, “Ms. Sun Phany is our Community Midwife. We always ensure her security even she has to travel by night for a delivery.” The chief of the health centre is also very proud of Phany and the team, which now works together more closely and is committed to improving the quality in the centre even further. New staff has been hired; two newly graduated secondary nurses and one secondary midwife. They were teamed up with Phany to learn from her experience. “I am working to transfer my skills to other midwife colleagues so that we can serve the community better”, Phany proudly states. Now, the health centre is also staffed during night and the utilization of basic health services has increased. For example, the number of deliveries increased from 12% in 2011 to 40% in 2013. Additionally, CARITAS is facilitating access to the health centre by supporting the community to organise transport to the health centre, using Tuk Tuks financed through community resources. 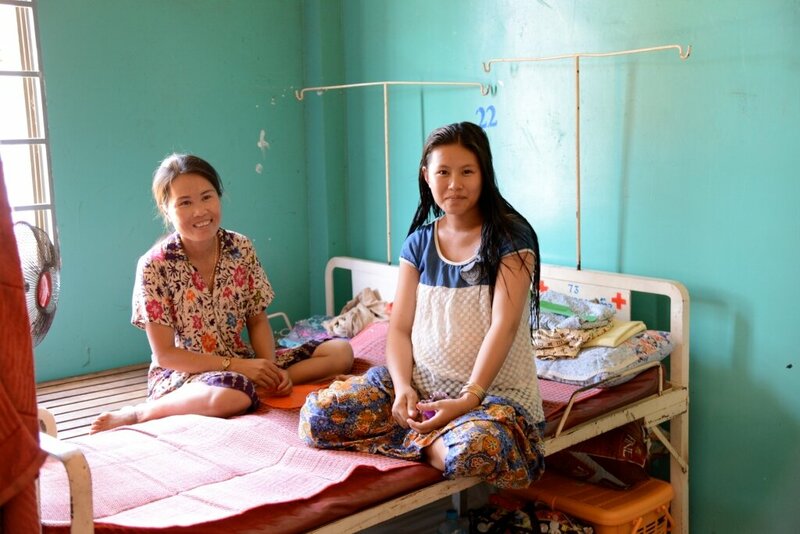 All in all, Chey health centre proves that a midwife like Phany can make a difference. She is an inspiration for the health centre team and the community. The story shows, that commitment from the chief of the health centre and the whole team is an important factor for improving health care services. On November 11, the 5th round table on the inclusion of persons with disabilities in German Development Cooperation’ took place. Dr. Gerd Müller, Federal Minister of Economic Cooperation and Development, opened the meeting and put emphasis on the importance of the issue. He stressed inclusion as a shared responsibility and genuine participation as an opportunity for all of us – they are quality characteristics of the German Development Cooperation. Country representatives from Cambodia, Zimbabwe and Indonesia were invited to lead three thematic working groups. The GIZ Social Health Protection Program presented their inclusion strategy and activities for persons with disabilities in the Cambodian health and social protection sector. The round table for inclusion serves as a forum for exchange between different actors of the German Development Cooperation, working to advocate for the rights of persons with disabilities. Daily group toothbrushing activity by students of Svay Kal Primary School in Kompong Thom Province. Kompong Chhnang, Kompot, Kompong Thom, Phnom Penh and Takeo Provinces, Cambodia – Diseases related to lack of hygiene, such as diarrhea and respiratory infections, are still the leading cause of death for children living in Cambodia. By the time children enter school, more than half are diagnosed with intestinal worms and vast majorities have dental caries, virtually all untreated. Compared to healthy pupils, students suffering from pain and disease are frequently absent from school, sleep less, and demonstrate an overall lower academic performance: Health status and school performance are closely related. GIZ’s Regional Fit for School Programme in Cambodia aims to prevent infectious diseases among public primary school students with the aim to improve school attendance through three simple and low-cost interventions: 1) daily hand washing with soap; 2) daily tooth brushing with fluoride toothpaste; and 3) bi-annual deworming. The programme has been supporting the School Health Department of the Ministry of Education Youth and Sport (MoEYS) of Cambodia implement its schemes since December 2011. 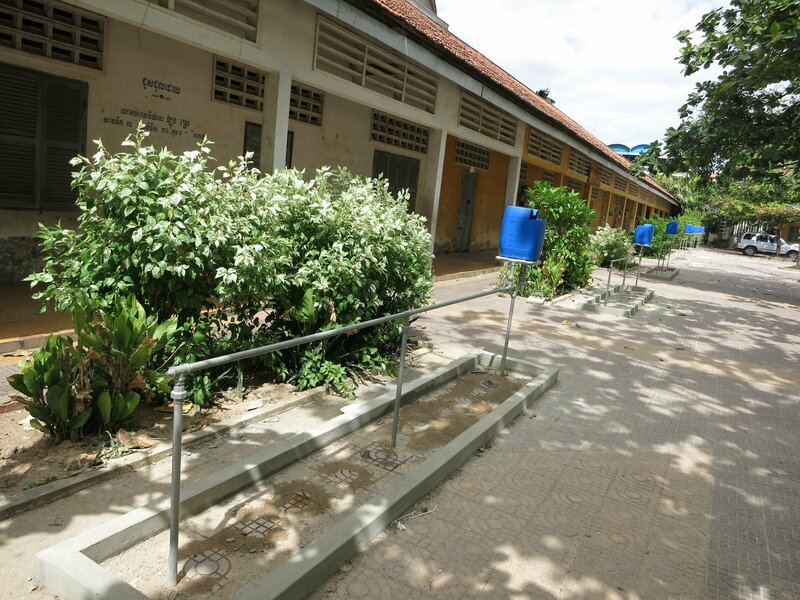 Since programme inception in Cambodia, nearly 8,000 students have benefitted from improved hygiene in ten public primary schools in Phnom Penh and other four provinces: Kompot; Takeo; Kompong Thom; and Kompong Chhnang. This regional programme is also being implemented in three other countries: Lao PDR, Indonesia and the Philippines. The programme aims to further support the MoEYS to scale up the program in collaboration with other partners to benefit 103,000 more primary students in Cambodia by 2015. Regional programme partners include SEAMEO INNOTECH, a regional center of the South-East Asian Ministers of Education Organization. After two years of programme implementation, the Regional Fit for School Programme in Cambodia is now supporting the Ministry of Education, Youth and Sport prepare for programme expansion in collaboration with partner organisations active in water, sanitation and hygiene projects (WASH) in schools, namely UNICEF Cambodia, ESC-BORDA and World Vision Cambodia. The programme expansion is led by the School Health Department of the MoEYS, and is supported financially by partner organisations that include daily group hand washing in schools in their respective WASH programmes. GIZ provides technical assistance on integrating daily hygiene activities in these programmes and instruction on how to support schools to construct necessary group washing facilities. 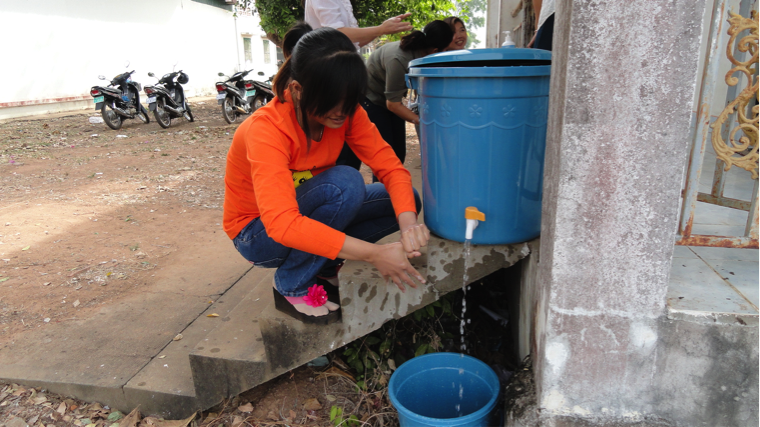 Daily group hand washing activity by students and teachers of Svay Kal Primary School in Kompong Thom Province. The geographical areas covered by the expansion include: additional schools in the five existing Regional Fit for School provinces, plus schools in Siem Reap and Preah Vihear provinces. To prepare for the expansion, the Regional Fit for School Programme team has been working very closely with the School Health Department and partners, and has been preparing and finalising programme tools necessary for building the capacity of educational officers at sub-national level. This capacity development will prepare the officers for the implementation of daily hygiene practice at the schools. The tools, which can also be used by the schools and communities to reinforce their participation in the programme, include the Fit for School School-Community Manual and video, and a group washing facilities catalogue. All materials were developed jointly with the MoEYS. With promising prospect, the Regional Fit for School Programme is committed to continuing collaboration with key stakeholders to ensure that the expansion is a success. Along the way, the programme will fulfill GIZ’s commitment to the health and well-being of Cambodian children and national development. Cambodia has one of the highest rates of disability in the world. GIZ is working with the Cambodian government and local NGOs to promote inclusion of persons with disabilities in the health service. That includes a screening and referral system for rural children at risk of long-term impairments. Moreover, part of GIZ’s work in Cambodia is promoting the voice of the disabled to overcome stigma and help them get access to health care. Uy Kosal, 26 years old, is a mother from ChhorVillage in KampongThomProvince. Her village health support group instructed her to bring her 4 months old daughter, Vat Varny, to Trea Health Centre for a medical check-up on ‘Health Centre Day’. Uy Kosal now understands how to feed her daughter better and has plans for corrective cleft lip surgery. 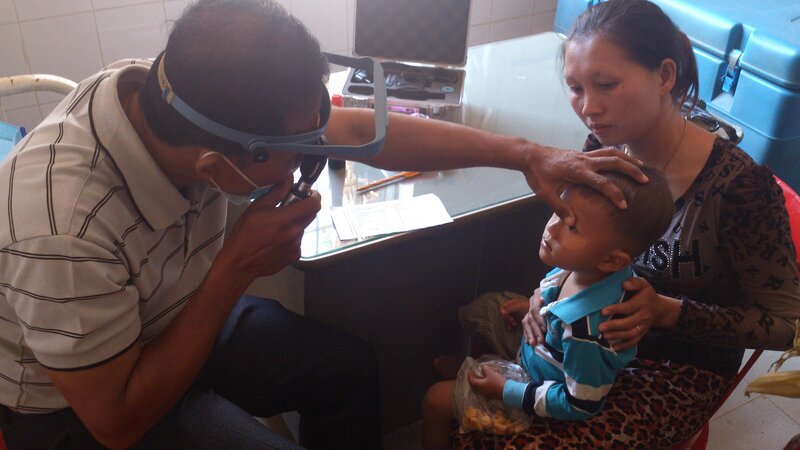 On this particular day, eye and ear doctors from Kampong Thom hospital and trained health centre staff provided consultation services to children under ten years old.Health care professionals focused their attention on children with impairments. Kosal was very worried about her daughter, born with cleft lip. Her daughter’s cleft lip makes feeding time difficultand as a result, she is under-weight. Cleft lip is closely linked to some ear diseases and may slow speaking.On Health Centre Day at Trea Health Centre, Kosal received information on how to feed her daughter and when and where she should bring her daughter for further treatment. Kosal was more relaxed after learning that the lips of her daughter can be treated at the age of 5 months with surgery at the Angkor Hospital for Children in Siem Reap. She is now motivated to breast-feed more often to help her daughter gain weight. 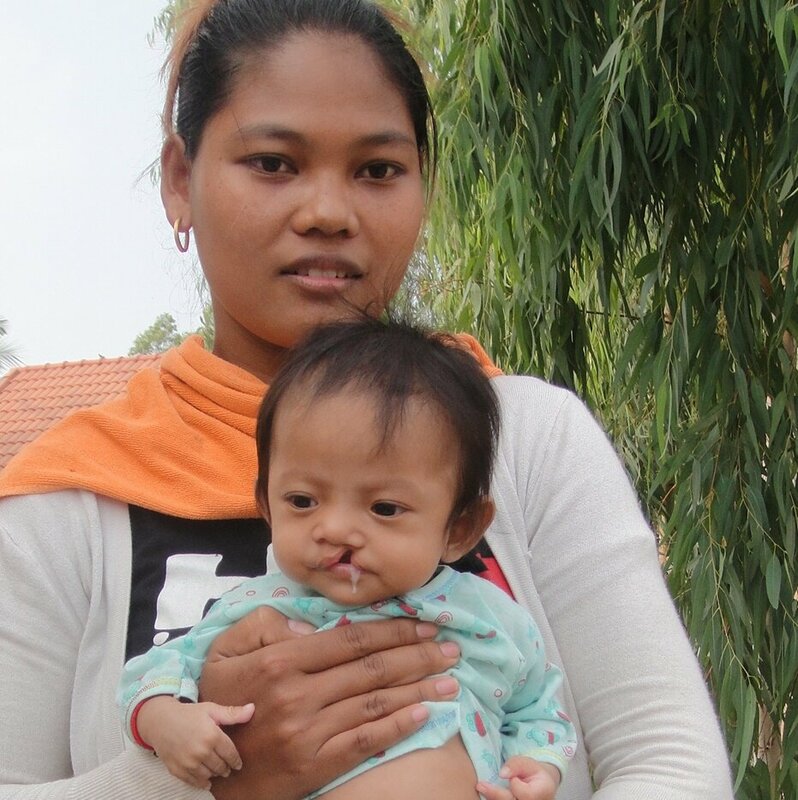 She plans to take her daughter to Siem Reap province for the cleft lip surgery recommended by her doctor. 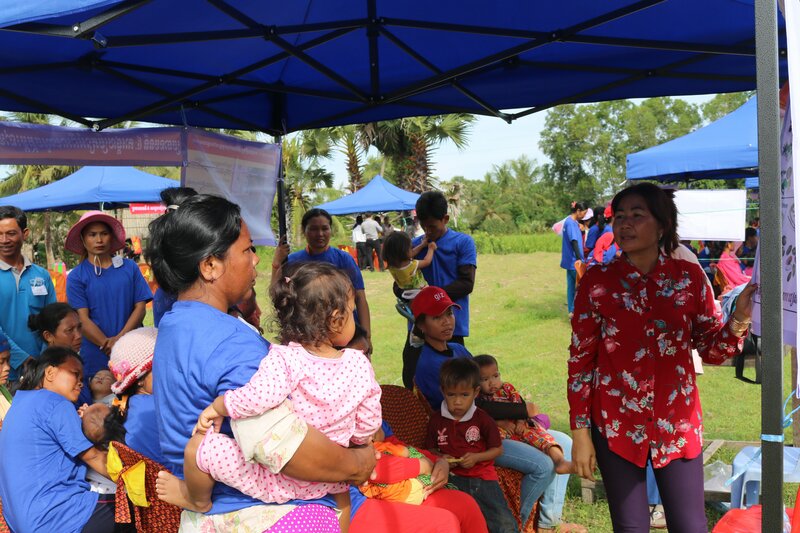 Health Centre Days are special events supported by GIZ and implemented by health centres and hospital doctors in Kampong Thom and Kampot province with support of Handicap International. The aim is to raise awareness on impairments and disabilities and to support early detection and intervention for children. Children that receive support with their disabilities will be more likely to achieve their full potential. Almost 10,000 girls, boys and their caregivers have participated so far. Over 330 children with disabilities were detected and referred to appropriate medical and support services. Services include those available at the NationalPaediatricHospital in Phnom Penh and AngkorHospital for Children in Siem Reap. For more information, please contact Heike.Krumbiegel@giz.de or Vanny.Peng@giz.de, GIZ Social Health Protection Project, Cambodia. More than one billion people across the world live with some form of disability, a large major­ity of whom live in developing countries. Pov­erty and disability are often interrelated. The United Nations Convention on the Rights of Persons with Disabilities (CRPD) represented a major step towards making disability a human rights issue, and became an important frame­work for disability-inclusive development coop­eration. The CRPD, ratified by Germany in 2009, encouraged and influenced development cooperation partners in their efforts to ensure greater inclusion of persons with disabilities in programmes and policies. Following its ratifica­tion, Germany developed a National Action Plan on the Inclusion of Persons with Disabilities and the Federal Ministry for Economic Coop­eration and Development (BMZ) elaborated its own Action Plan for the Inclusion of Persons with Disabilities (2013), which aimed to ensure systematic mainstreaming of the inclusion of persons with disabilities in German develop­ment policy. It outlined several strategic objec­tives and measures to be incorporated into de­velopment cooperation. One measure is the in­clusion of persons with disabilities within the health sector in Cambodia, building on the ex­isting partnership with the Cambodian Govern­ment in this area. Cambodia ratified the Convention in 2012, committing itself to promoting the equality of persons with disabilities in all spheres of soci­ety. 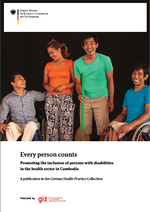 In 2011, the Royal Government of Cambo­dia and the German Government agreed dur­ing its cooperation meetings to develop ideas about how to mainstream the inclusion of per­sons with disabilities in current and future co­operation activities to ensure that one of the most vulnerable groups of Cambodian society could increasingly participate in and benefit from poverty reduction programmes and devel­opment initiatives. 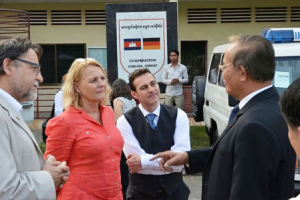 Based on this decision, Ger­many provided additional resources for the pri­ority area Health (Social Health Protection Pro­gramme) of Cambodian-German bilateral de­velopment cooperation. They were allocated in June 2012 to the Technical Cooperation (TC) project implemented by the Deutsche Ge­sellschaft für Internationale Zusammenarbeit (GIZ), operating on behalf of BMZ to enhance the inclusion of persons with or vulnerable to disabilities. principles laid out in BMZ Action Plan for the In­clusion of Persons with Disabilities, the authors present key developments and lessons learned from the inclusion of persons with disabilities in the Social Health Protection Project, which is part of the Cambodian-German Social Health Protection Programme. The first section pro­vides a brief overview of disability prevalence and different forms of disability as well as main challenges persons with disabilities face in rela­tion to health care access in Cambodia. In the second section, the authors describe the pro­cess of mainstreaming the inclusion of persons with disabilities in the health sector, outlining key elements of this work and factors influenc­ing success. 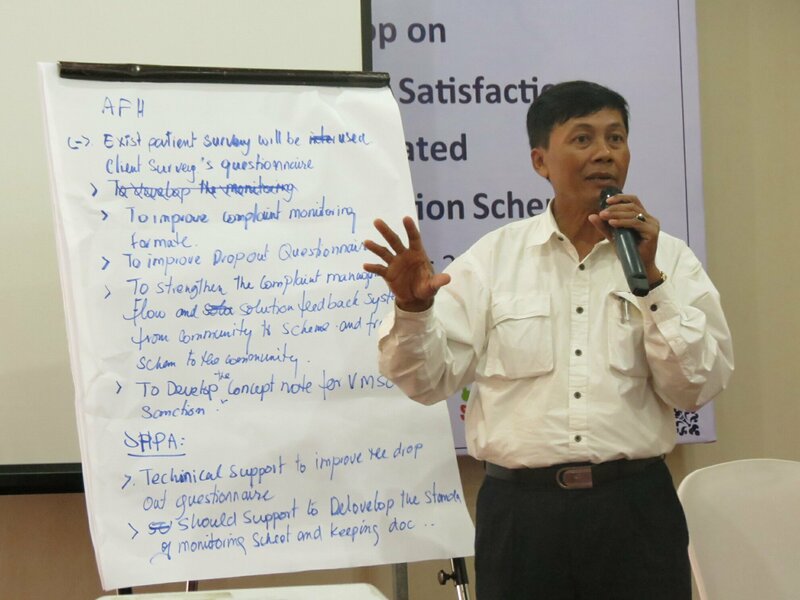 With the aim of advancing social health protection in Cambodia, operators of social health protection schemes across Cambodia joined forces to establish an association that would allow for a collective voice and provide a platform for collaboration. The initiative would also enable access to quality technical support, attracting financial resources; and promote information sharing and policy development within the sector. Therefore, a number of organisations joined hands and contributed to the establishment of a new capacity development institute for NGOs active in the social health protection sector e.g. as operators for the Health Equity Funds (HEF), integrated social health protection schemes (extended HEFs through voluntary enrolment programmes), and Micro Health Insurance (MHI). This new institute, the Social Health Protection Association (SHPA), began its operations, with support of GIZ, in May 2012. 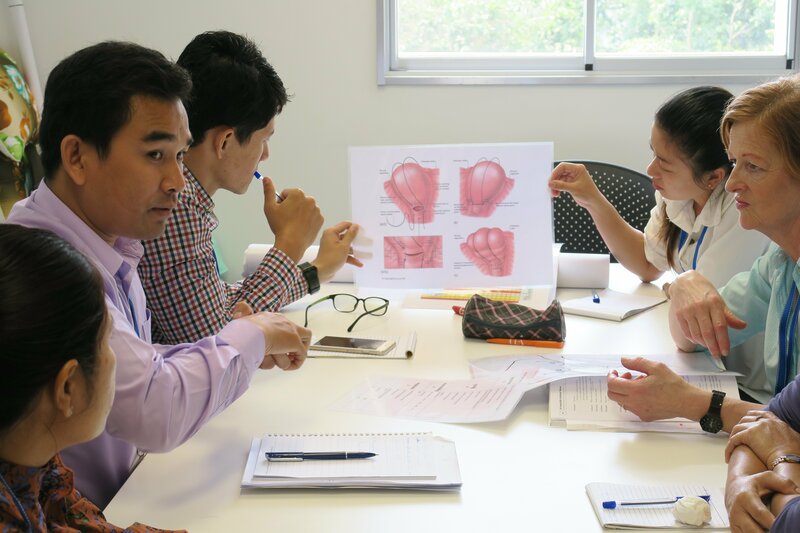 SHPA’s mission is to support and promote the quality, sustainability and coverage of voluntary enrolment programmes and other social health protection schemes in Cambodia. To provide an information and communication platform for all stakeholders. To fulfill its aims, SHPA developed a work-plan, based on key support needs identified by its members, with additional inputs from the Ministry of Health and other key partners. In line with the plan, SHPA organised various workshops and capacity building trainings. The majority of the Cambodian population initiates medical treatment in the private sector. Approximately 30% initiates care in public health facilities. The main reason for this is the perceived low quality of care in the public sector. Many Cambodians prefer private providers because they are seen as friendlier and more responsive to patients’ needs, even if the technical quality of services is inferior to that provided in the public sector. Improving misperceptions of the quality of public health services, and thus overall client satisfaction, is essential to ensure optimal operations of a social health protection scheme. The Ministry of Health guidelines for SHP schemes require operators to address these issues through specific activities to monitor and respond to clients’ feedback. In response, a client Satisfaction Survey Tools (CSST) was developed by the Quality Assurance Office of the Ministry in 2009 with assistance from GIZ. The intent of the CSST is to provide a standardised survey instrument and data collection methodology for measuring clients’ perspectives on care provided by hospital and health centres. Social health protection schemes have a strong incentive to improve clients’ perceptions of health services by contracted providers, as enrolment –and service utilization- correlates with the population’s satisfaction with these services. Measuring client satisfaction with feedback on the results to providers to inform quality improvement activities, together with effectively addressing complaints while allowing the communities to voice their opinions, are important tasks of SHP operators. Most SHP schemes conduct satisfaction surveys amongst their members and have mechanisms for dealing with complaints and raising issues with healthcare providers. However, these are not standardized across the schemes. Figure 1 and 2: Participants discussed a wide-range of topics from improving client satisfaction to strengthening external feedback. 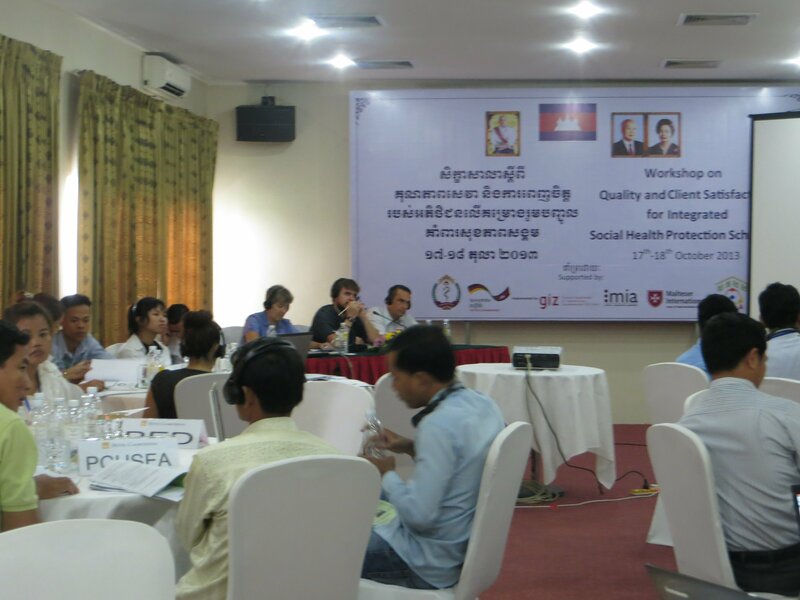 In response to these requests, SHPA conducted a workshop on Quality and Client Satisfaction for Integrated Social Health Protection Schemes on 17-18 October 2013. During the workshop the operators, SHPA, and representatives from the MoH, and GIZ focused on client satisfaction surveys and tools, complaints mechanisms, data collection, storage and analysis, internal review of data and feedback, and strengthening external feedback to clients, communities, providers and local authorities. Development of standard operating procedures for all associated processes. Following the results and recommendations from this workshop, SHPA will continue to advocate for the standardisation of tools and approaches, continue the collaboration with the MoH on the development of a data system, and organise a follow-up workshop in 2014 on interview skills and data entry and analysis for field-level staff. The Cambodian Ministry of Health and its partners are taking on the challenge of securing universal access to quality health care. The act aims to do so without risking impoverishment and indebtedness, by covering patients’ direct expenditure related to health through social health protection schemes. Out-of-pocket expenditure constitutes more than two thirds of overall health spending in Cambodia. The health sector’s high reliance on ‘fees for services’ coupled with lacking social health protection puts people at financial, social and economic risk. It can further deter them from seeking health care when in need, as expenses are unpredictable. With lower risk of debt, more pregnant women will seek maternal healthcare. 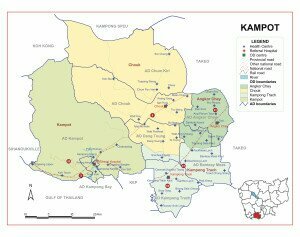 In January 2013, the ‘Integrated Social Health Protection Scheme’ was launched in Stoung Operational District in Kampong Thom Province. This innovative approach supported by GIZ’s Social Health Protection Project allows voluntary enrollment in a Social Health Protection Scheme by extending the services of Health Equity Funds. Families can protect their members by joining the scheme and paying an affordable contribution. Through this mechanism, health care users with greater health needs can access public health services whenever needed without risk of impoverishment, of falling into debt and poverty because of unaffordable or unpredictable health care bills. Without discrimination, all pre-identified poor households as well as voluntary enrollees are granted access to the same package of health services. In the scheme’s first months, membership of the scheme has experienced a positive upside trend, increasing to 29% of the population in Kampong Thom. Families identified as ‘poor’ may now be better reimbursed for their health care costs. The Non-governmental Organisation Action for Health (AFH) operates the scheme. Its tasks as operator include, promotion of voluntary enrolment, awareness raising, collection of contributions, reimbursement the providers for medical service costs. But most importantly, AFH also represents the interests of all scheme-members, poor, which are exempted of contributions, or voluntary. 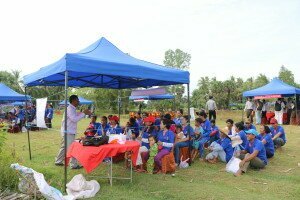 By doing so, AFH plays an important role in securing scheme-members rights and promoting adequate health service provision for the entire population in Kampong Thom. The schemes’ expansion demonstrates strengthened efforts to make quality health services affordable, accessible and more equitable for all Cambodians. The scheme extends health care to those previously untreated and reduces the risk of slipping into poverty and debt when falling ill and seeking care. The expansion constitutes another step towards Universal Health Coverage. Kompong Chhnang, Kompot, Kompong Thom, Phnom Penh and Takeo Provinces, Cambodia – Diseases related to lack of hygiene, such as diarrhea and respiratory infections, are still the leading cause of death for children living in Cambodia. By the time children enter school, more than half are diagnosed with intestinal worms and a vast majority has dental caries, virtually all untreated. Students suffering from pain and disease are frequently absent from school, sleep less, and demonstrate an overall lower academic performance, compared to healthy pupils: Health status and school performance are closely related. GIZ’s Regional Fit for School Programme in Cambodia aims to prevent infectious diseases among public primary school students to improve school attendance through three simple and low-cost interventions: 1) daily hand washing with soap; 2) daily tooth brushing with fluoride toothpaste; and 3) bi-annual deworming. The programme has been supporting the School Health Department of the Ministry of Education Youth and Sport (MoEYS) of Cambodia with the program implementation since December 2011. Regional programme partners include SEAMEO INNOTECH, a regional center of the South-East Asian Ministers of Education Organization. 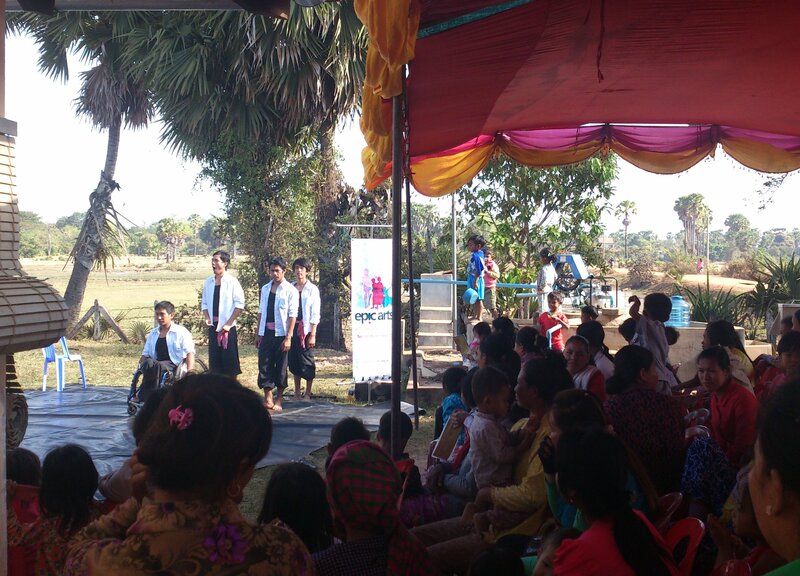 Since its inception in Cambodia, the programme has benefitted nearly 8,000 students in ten public primary schools in Phnom Penh and other four provinces: Kompot; Takeo; Kompong Thom; and Kompong Chhnang. This regional programme is also being implemented in three other countries: Lao PDR, Indonesia and the Philippines. A regional networking meeting was organized in Cambodia from 25-26 June 2013 to allow delegates from Indonesia’s Regional Fit for School Programme the opportunity to observe programme implementation in Cambodia, exchange programme information and experiences with implementation. Six representatives from Indonesia’s Department of Health, Department of Education, and Department of Community Welfare in Bandung and Indramayu, Indonesia represented the delegation. Dr. Ramon Bacani, Director of SEAMEO INNOTECH, and Regional Fit for School Coordination Team and Project Managers in Indonesia and Lao PDR, also joined the visit. The School Health Department of the MoEYS Cambodia hosted the event in coordination with GIZ’s Fit for School Programme’s country team. At MoEYS in Phnom Penh, H.E Nath Bunroeun, Secretary of State, expressed his warm welcome to the Indonesian delegates and noted that the Regional Fit for School Programme applies evidence-based and low-cost interventions to address school health issues in Cambodia. Interventions such as these make the programme suitable for scale-up, countrywide. H.E. congratulated the School Health Department and thanked GIZ and all implementing partners for their support and collaboration efforts to improve the well-being of Cambodia’s children. 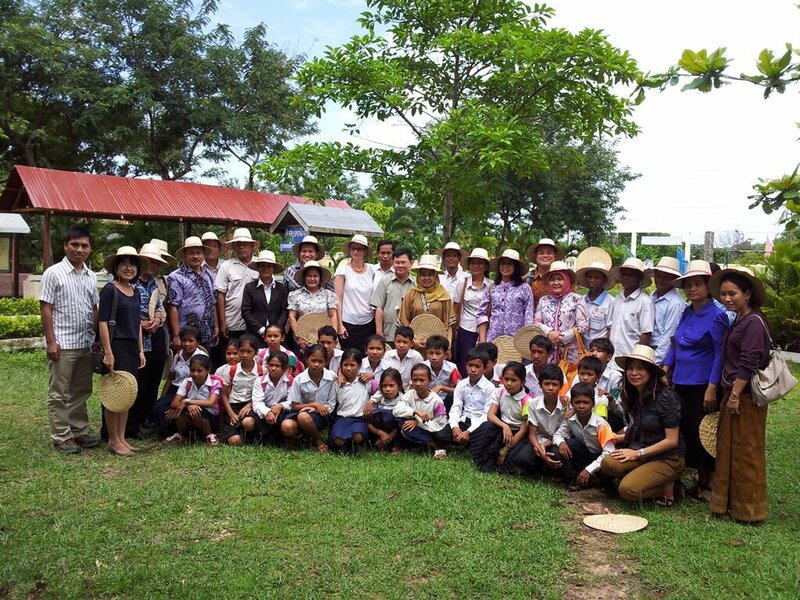 During the two-day event, the delegates visited three programme model schools in Takeo and Kompong Thom Provinces to observe the students’ daily hand washing and tooth brushing activities. Additionally, the delegation held meetings with school principals, teachers, commune councils and School Support Committees to discuss success and challenges with implementing the Regional Fit for School Programme. Mr. Rigil Munajat, Project Manager of the Fit for School Programme in Indonesia, noted that he was ‘impressed by Cambodia’s commitment to the programme and that model schools in Cambodia implement hand washing and toothbrush activities with their students every school day’, six days a week. The delegates were also impressed by the steps taken by the School Health Department to secure programme sustainability by including a budget for programme materials for the upcoming year submitted to the national government. This action will support the School Health Department with the development of a plan to cover the costs of programme materials from next-year onwards. Phnom Penh, Cambodia Following on from the webinar “ICT to support Social Health Protection” organized by GIZ Bangladesh and the Joint Learning Network in October 2012, CIM expert Michael Stahl proposes in this article that harmonizing health information systems should be a priority for technical assistance for social health protection. 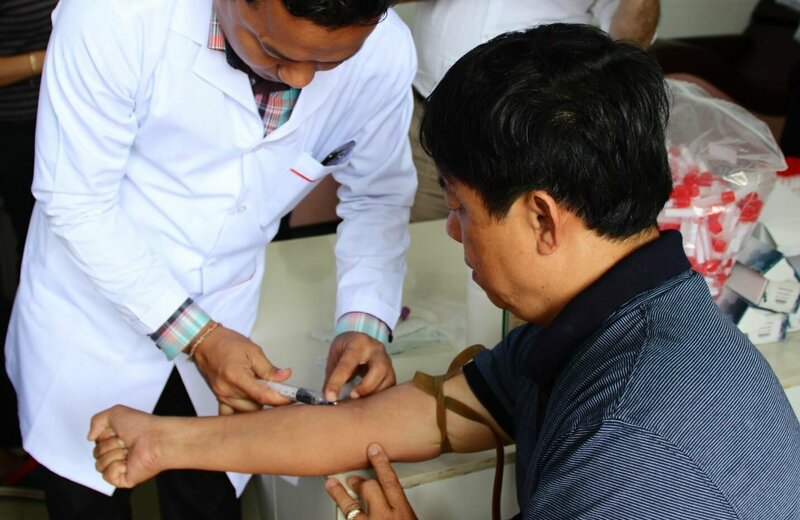 Many de­vel­op­ing coun­tries in Asia, such as Vietnam, Laos, Indonesia and the Philippines, have already introduced social health insurance schemes to different extents, but are now dealing with highly fragmented IT applications among health care implementers. The same issues are found in several African coun­tries. Other de­vel­op­ing coun­tries have yet to implement health insurance programmes, or are in the final planning stages, and their governments would like to avoid making the same mistakes as neighboring coun­tries. Cambodia, Bangladesh and Nepal are good examples of countries, which are beginning technical implementation of social health insurance systems. In addition, planning and experimentation of these systems are happening in isolation within each coun­try, when viable solutions may already have been developed in other coun­tries. Apart from many practical concerns in achieving health care goals in de­vel­op­ing coun­tries, one of the main issues is the use of information technology (IT) in health services, and the lack of harmonized approaches in planning, de­vel­op­ing and implementing IT solutions for social health protection implementation. This paper focuses on the operational side of social health protection implementation in de­vel­op­ing coun­tries, explaining how harmonization of social health insurance schemes benefits all stakeholders, and describing how monitoring and evaluation activities can be unsuccessful or lead to wrong results. The relationship between improperly working operational aspects of data management, and the difficulties that arise from this situ­a­tion, are also examined. Lastly, the reasons for high fragmentation rates among social service implementers are discussed. Kampong Thom, Cambodia Mothers and their newborns in three provinces (Kampong Thom, Kampot and Kep) will benefit from equipment and supplies to improve their health, funded by the German Government as a result of a partnership agreement between the German international cooperation agency, GIZ, and the UN children’s agency, UNICEF. With the German grant, UNICEF procured equipment valued at more than $ 500,000 including ultrasound scanners, foetal heart detectors, sterilizing apparatus, surgical delivery instruments and resuscitators, to enhance the delivery of quality essential and emergency obstetric and newborn care services to some 300,000 women of reproductive age attending government health centres and hospitals in the three provinces. The supplies also include newborn kits with baby care items to be given to mothers attending government health facilities, with a view to encouraging community demand and utilisation of health services. While Cambodia has made good progress with reducing maternal and child mortality, three out of four newborn deaths occur in their first week of life, especially during the first day, largely due to complications at birth and lack of postpartum care. Receiving the equipment, the Secretary of State for Health, Ministry of Health, His Excellency Professor Eng Huot, said, “Limited resources – human and financial – continue to be a major constraint to scale-up essential and life-saving health interventions to reduce maternal mortality. We are therefore, most grateful that the German Government and UNICEF have responded together to work with us to address this issue. The German Federal Ministry for Economic and Development (BMZ) is funding development cooperation programmes in 50 developing countries worldwide. The cooperation with the Royal Government of Cambodia was resumed in 1994 and is mainly implemented by Deutsche Gesellschaft für Internationale Zusammenarbeit, GIZ, and KfW Entwicklungsbank. Health and Rural Development are the two priority areas of German Development Cooperation in Cambodia, facilitated by a cross-cutting area Good Governance. Technical and financial assistance in the health sector is provided through the “Social Health Protection Programme”, with a focus on health care financing, health service delivery, and health system governance. The Rights-based Family Planning and Maternal Health (Muskoka) project is part of this programme. Kuala Lumpur, Malaysia Meghan Olson from the Muskoka Project took part in the Women Deliver conference in Kuala Lumpur from 28 to 30 May 2013. During the three day conference she attended lectures on: the social and economic benefits of investing in women’s reproductive health; comprehensive sexual education; closing the gap in MDG 5; gender and family planning; women’s health; challenges for women in leadership; global progress in family planning; gender based violence and sexual and reproductive health and rights; benefits/challenges of public private partnership; ending violence against women; contraception in the post 2015 agenda; adolescent girls in health and development; population, sustainability, and women’s rights; and male involvement in maternal and newborn health. This conference provided an invaluable opportunity to learn from the experiences of other professionals and organizations in the field and share first experiences of the GIZ Muskoka project. Meetings took place between colleagues from GIZ HQ and MEDICONSULT (Muskoka Consultant Ms. Pinging Yeoh) to discuss and conclude on the baseline study on knowledge, attitude and clinical practice of midwifes. Dr. Alexandra Piprek from Malteser International also attended. Her participation has been supported by GIZ and the EU. Please visit the conference site to find information on the program, media, partner events, exhibition and sponsorship opportunities, and more. You can watch the archived videos at new.livestream.com/womendeliver. 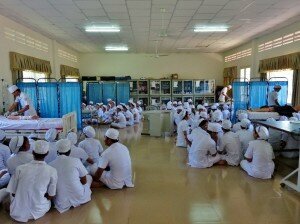 Phnom Penh, Cambodia - Surgery is an essential part of health care. It can cure illness, reduce morbidity and save lives. Surgery also frequency leads to complications that include excess bleeding, wound infection, anesthesia problems and even death. Surgical complications are caused by many factors depending on the condition of the patient ranging from old age to health status. However for complications that are related to quality of health care, it is estimated that at least half could be avoided by routinely checking common safety issues and improving team communication. General data for Cambodia is not available, but international studies show that complications due to surgery occur in up to 10% of cases. In high-income countries, death related to surgical complications can occur in 0.9%, whereas in low- and middle-income countries the rates soar to 11.7 % of surgery resulting in complications and 2.1% in death. To increase the safety of surgery, the World Health Organization (WHO) developed “Surgical Safety Checklist” in 2008. The checklist targets 10 essential objectives for safe surgery, such as surgery location, provision of safe anesthesia, the management of airway problems and hemorrhage. The checklist is grouped into three sections, requiring the verbal check and exchange of information immediately before the induction of anesthesia, immediately before the skin incision and right after skin closure. WHO encourages local adaptation of the checklist if appropriate. It is recommended for the checklist to be read aloud and verbally confirmed within the operating team. This potential life saving process clocks-in at less than two minutes. The checklist has been evaluated in 8 different countries and settings and has proven its effectiveness. The use of the checklist reduced the rate of postoperative complications by more than one-third. WHO estimates that with the general use of the checklist up to half of related death case could be avoided. It is estimated that 234 million people are operated each year and more than one million of these individuals die from complications fatalities. Using the surgical checklist could result in more than 500,000 lives saved on an annually basis. The improvement of the quality of health care is one of the top priorities of the Ministry of Health (MoH) and is supported by the Social Health Protection Project of GIZ. 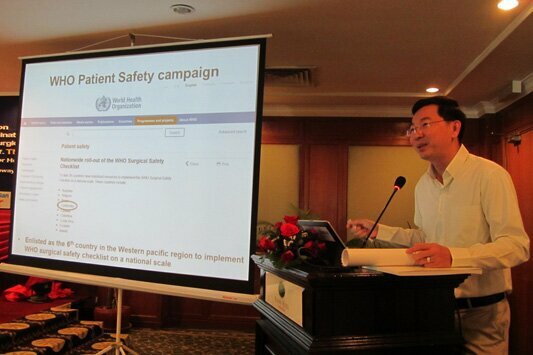 Therefore the Quality Assurance Office of the MoH together with WHO Office in Cambodia identified the checklist as a ‘promising tool’ to increase the quality of surgical care. 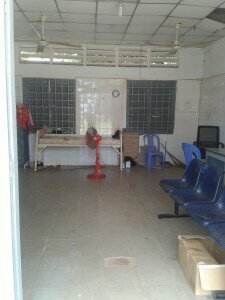 Surgery in Cambodia, which is provided in public CPA 2, 3 and National Referral Hospitals, is on the rise. The changes in morbidity towards non-communicable diseases, such as cancer and traffic accidents are two of the reasons why this trend will probably persist. Together with WHO, the Quality Assurance Office of the MoH developed a project plan to test the feasibility and the effects of the checklist. Financial support was received by funding from the Australian Agency for International Development, AusAID. The project included establishing an expert advisory board, a two-phased pilot, and a staff evaluation survey in participating hospitals. 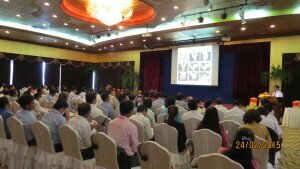 Members of the advisory board included experienced surgeons as well as anesthesiologists and scientific associations, such as the Cambodian Surgical Society, donors and pilot hospitals. Pilot hospitals included the National Pediatric Hospital in Phnom Penh and the Referral Hospital in Svay Rieng. The pilot, that took place from October 2012 to January 2013, showed promising results. As surgical safety improved, surgical complications (especially wound infections) decreased. Additionally, communication among surgical staff improved and awareness for quality improvement raised. Survey results completed by surgeons, anesthesiologist and nurses showed a very positive attitude. For example, all participants affirmed that they would like the checklist to be used in case they had to undergo surgery themselves. Due to these convincing results, MoH quickly officially approved the checklist. The Cambodian “Safe Surgery List” is now to be used nationwide in all public hospitals where major surgery is performed. 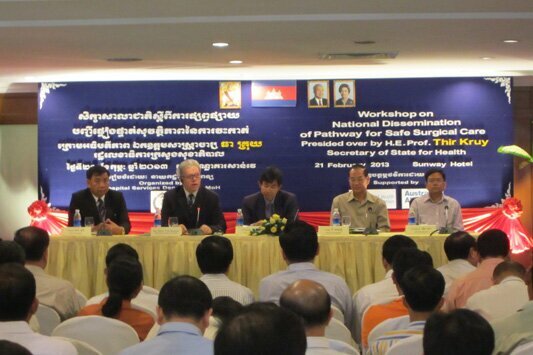 Two dissemination workshops in February 2013 marked the official nationwide roll-out. The 170 participating surgeons, anesthesiologists and nurses of the according hospitals learned about the checklist, its use and expected effects. To enable them to train the staff in their institutions, they were provided with materials for training and dissemination. Members of the advisory board took a very active role in this process. For example, their experience and expertise was applied to adapt the original WHO checklist to survey results and the local context and language. The board also provided the workshop audience with hands-on peer experience when presenting their results and answered critical questions related to content and handling of the checklist. The checklist will be included in the up-dated CPA Guidelines, which define the role, function and service of public hospitals. An additional measure to ensure its national routine use will be the assessment of the checklists’ use during hospital assessment surveys. The monitoring and evaluation of the routine use this year will be supported by GIZ. These steps exemplify successful project cooperation. The pilot was conducted by the QAO with technical support from a WHO officer and the integrated CIM-expert, funded by AusAID. 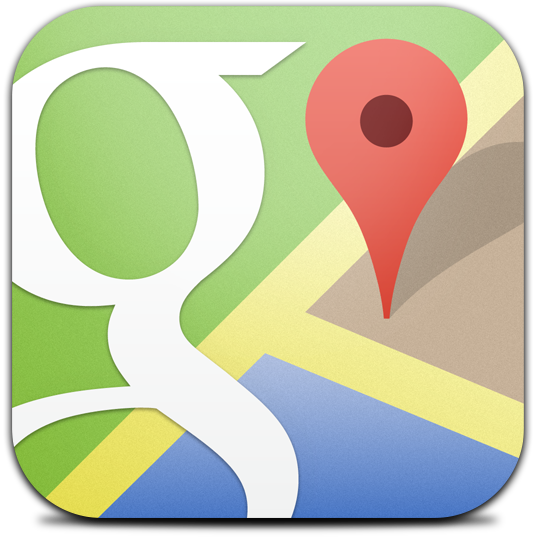 Monitoring of its routine use in 2013 will be supported by GIZ. Cambodia is now the 26th country worldwide and the 6th country in the WHO pacific region, which has implemented the checklist nationwide. Kampot Province, Cambodia – Artistic expression is a common human characteristic, unlocking creative potential and defying borders. 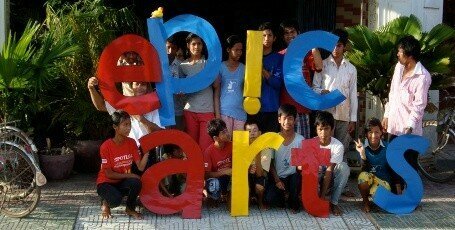 Epic Arts, a disability-arts NGO (http://www.epicarts.org.uk), works towards equality by reaching out to people with physical and learning disabilities and provides deaf education and education for children with learning disabilities as well as vocational training in Kampot Province, Cambodia. Through art, Epic Arts seeks to live out the values of inclusion, understanding, justice and equality. The organization celebrates the richness of diversity through dance and theatre performances and creative workshops. Additionally, it runs a café, selling handicrafts produced by people with impairments. The café not only offers employment to the disabled, but also acts as a social hub for people with disabilities. Students of the Women’s Media Centre produced a short documentary on the work of Epic Arts with support from the DW Academy (http://blogs.dw-akademie.de/asia/2013/01/09/reporting-about-people-with-disabilities/) and the GIZ Social Health Protection Project. 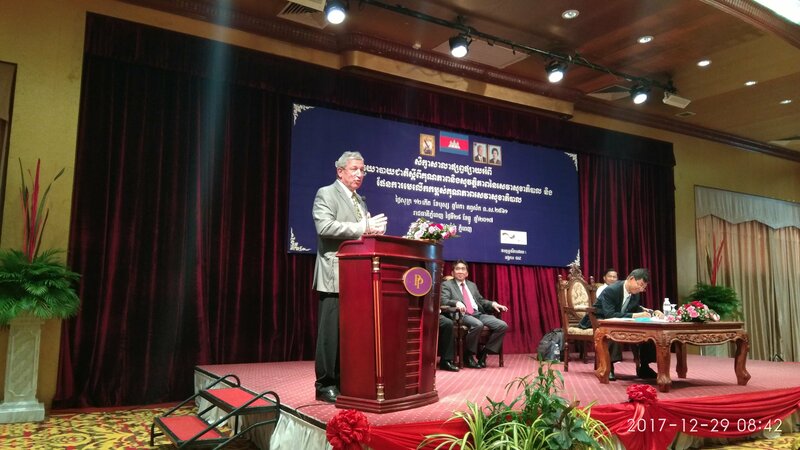 On behalf of the German Federal Ministry of Economic Cooperation and Development, GIZ supports the Royal Government of Cambodia in disability inclusion in the development process. With the government’s ratification of the UN Convention on the Rights of Persons with Disabilities, disability inclusion assumes a more prominent role in development cooperation programmes, to ensure that the most vulnerable groups in society benefit from poverty reduction and development. To promote the inclusion of people with or vulnerable to disabilities the GIZ’s Social Health Protection Project deploys a mainstreaming approach in all its areas of intervention and supports selected, targeted activities in close collaboration with Handicap International Cambodia and other organisations representing people with disabilities, such as Epic Arts. The GIZ Social Health Protection Project will further cooperate with Epic Arts in awareness rising activities and advocating for inclusive health services in the province of Kampot, one of the project’s target-areas. GIZ Social Health Protection Project seeks to involve people with disabilities and civil society as much as possible in local processes of health sector development and to complement existing efforts. Kampong Thom Province, Cambodia While Cambodia’s under-five mortality rate declined from 83 deaths per 1000 live births in 2005 to 54 in 2010, the neonatal mortality rate has stagnated during the same time frame (28 deaths/1000 live births in 2005 and 27 deaths/1000 live births in 2010). 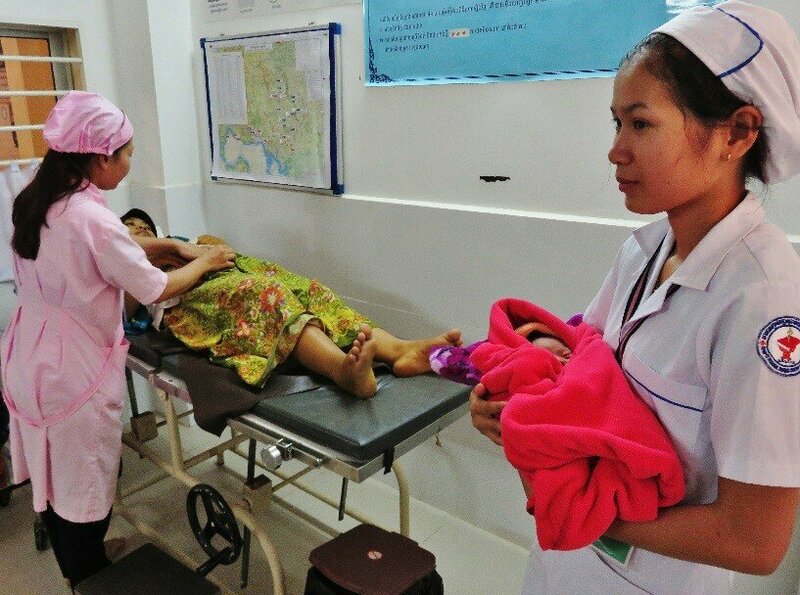 Neonatal deaths now account for more than half of all under-five deaths in Cambodia. The most common causes include infection, birth asphyxia and preterm deliveries. Preventative measures such as thorough drying, skin to skin contact, properly timed cord clamping and early breastfeeding have been show to save newborn’s lives. Additionally, ventilation of non-breathing babies within one minute after birth, or within the vital “golden minute” also contributes to saving newborns at risk of post-natal death.. Immediate and thorough drying stimulates breathing and prevents hypothermia. Amongst many other benefits, sustained skin-to-skin contact initiates colonization of the newborn with maternal flora. Delaying cord clamping reduces the risk of anemia in preterm infants, and intraventricular hemorrhages. Early initiation and exclusive breastfeeding can prevent more than 95% of neonatal sepsis deaths. Emphasizing the need to reduce neonatal mortality, Cambodia’s Ministry of Health requested WHO’s support to strengthen immediate newborn care in Kampong Cham province. 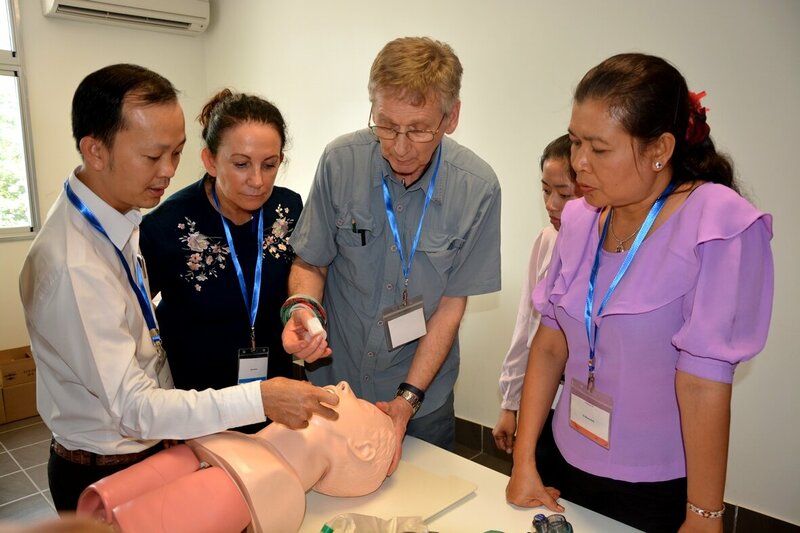 In 2011, Dr. Howard Sobel (WHO) and Ms. Chris Newsome (pediatric nurse, RACHA), developed a 2-day training and piloted it in Kampong Cham province. Based on the success of the pilot, the Ministry of Health decided to roll-out this training nationwide. Training of trainers for the Provincial Health Department and Operational District staff from all provinces is ongoing and will be finalized in 2013. 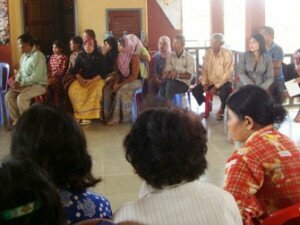 Three facilitators and 5 co-facilitators from Kampong Thom province have already been trained in December 2012. The Immediate Newborn Care (INC) coaching sessions are very hands-on. There are no lectures and all information is provided to participants in the form of questions. 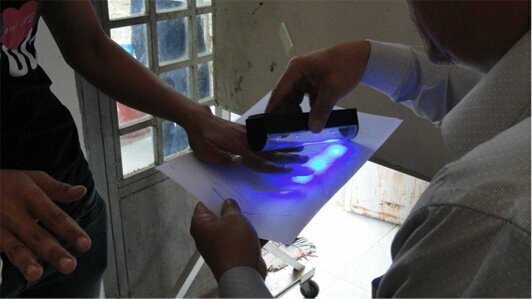 Evaluations during the training include written tests (pre- and post-test), measures of hand hygiene (using Glow Germ – see image) and demonstrations of the sequential steps. At the end of the second day, each participant has to demonstrate that he or she is able to carry out all steps of immediate newborn care in the correct order and in the correct time frame. The steps for the breathing and non-breathing baby are assessed in two separate demonstrations and role-plays. If the participant is able to repeat the correct steps during a follow up supervision visit at the health facility, he or she will be given a certificate of successful course completion. 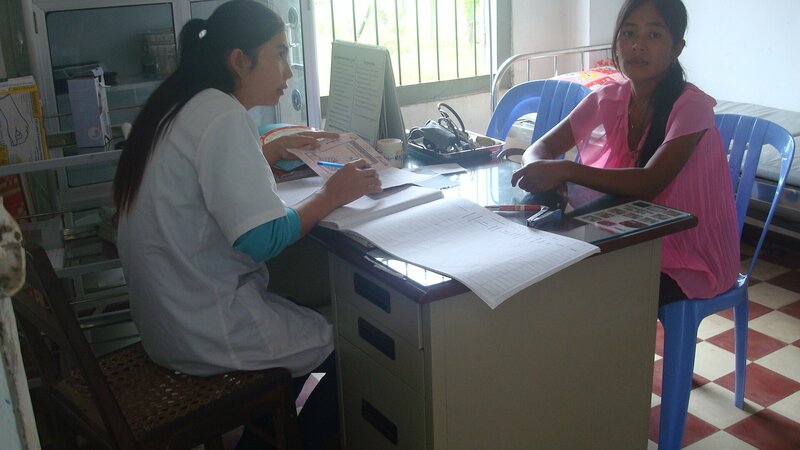 With the technical and financial support of the GIZ Rights Based Family Planning and Maternal Health project (Muskoka), the INC facilitators in Kampong Thom conducted 4 coaching sessions at the Baray Santuk referral hospitals in February and March 2013. A total of 40 midwives successfully demonstrated mastery of the sequential steps that may save a newborn’s life. Evaluations during the training include written tests (pre- and post-test), measures of hand hygiene (using Glow Germ) and demonstrations of the sequential steps. With 9 additional coaching sessions planned in 2013, a total of 130 midwives and doctors will become proficient in correct immediate newborn care in Kampong Thom province. Giving health care workers the skills they need to provide all newborns with the care they require in the first minutes of life is a big step towards increasing the chances of survival for these precious new lives. Phnom Penh, Kompot, Takeo, Kompong Thom, and Kompong Chhnang Provinces, Cambodia – Children throughout Cambodia are busy washing their hands and brushing their teeth in efforts to prevent disease and promote good hygiene. “Thanks to the programme, primary school students are now washing their hands with soap and brushing their teeth with fluoride toothpaste at least once a day on every school day.” Mrs. Ayphalla Te, Country Project Manager, Regional Fit for School Programme said. GIZ’s Regional Fit for School Programme with a focus on Pandemic Preparedness has been supporting the School Health Department of the Ministry of Education Youth and Sport (MoEYS) of Cambodia with the programme implementation since December 2011. Regional partner of the programme is SEAMEO INNOTECH a regional center of the South-East Asian Ministers of Education Organization. Since its inception in Cambodia, the programme has benefitted nearly 8,000 students in ten public primary schools in Phnom Penh and other four provinces: Kompot; Takeo; Kompong Thom; and Kompong Chhnang. The programme also works with schools to ensure students receive and take a deworming tablet twice a year. Diseases related to lack of hygiene, such as diarrhea and respiratory infections, are still the leading cause of death for children living in Cambodia. By the time children enter school, more than half have intestinal worms and a vast majority have dental caries – virtually all untreated. Children’s health is closely related to their academic progress and performance in school. Students suffering from pain and disease are frequently absent from school, sleep less, and show an overall lower academic performance compared to healthy pupils. GIZ’s Regional Fit for School Programmeaims to prevent infectious diseases with three simple and low-cost interventions: 1) daily hand washing with soap; 2) daily tooth brushing with fluoride toothpaste; and 3) bi-annual deworming. The programme is designed based on the Fit for School approach pioneered in the Philippines with a great success by the Department of Education (DepED) and with support from the local NGO Fit for School Inc. as well as GIZ. By working with the schools to construct washing facilities and ensuring availability of a functioning, running water system and providing soap and tooth brushing kits to students, the programme supports an enabling environment for students to practice daily hygiene activities together. “The students clearly enjoy the daily hand washing and tooth brushing activities. Their breath smells better, and the homework papers they hand in are much cleaner because of their freshly washed hands,” said the teacher of a participating primary school, whom was trained by the Regional Fit for School Programme to implement the daily group hygiene activities with students. Hand washing with soap and water is one of the most effective preventive measures against major infectious diseases. GIZ’s Regional Fit for School Programme is encouraging a change in primary school students’ hand washing behaviour by practicing this everyday. Subsequently, good habits are ingrained at a young age and the students are more likely to continue good hygiene as an adult. The students’ knowledge also sparks their interest to change their hygiene practices at home. In the long-term, the programme aims to work with the Ministry of Education, Youth and Sport of Cambodia to institutionalize the programme approach and principles into the national school health system, so that the programme can be scaled-up to benefit many more public primary schools and students in Cambodia. Kampot Province, Cambodia. 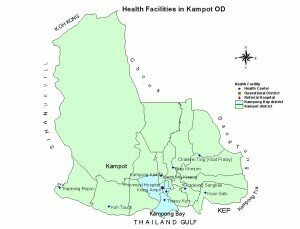 – In Kampot Province change is happening in the health sector. 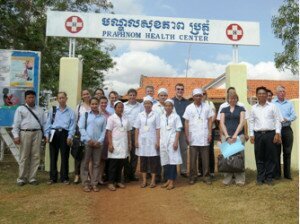 German Technical and Financial Cooperation jointly support for example, the Pra Phnom Health Centre to improve the quality and accessibility of health care services. As the result, health services utilisation has increased to more than 80% within two years. On 2-3 March 2013, Dr. Andreas Pfeil, BMZ, headed a delegation from the Federal Ministry of Economic Cooperation and Development Germany (BMZ), GIZ and KfW to Kampot Province to see first-hand how development in the health sector has progressed. After visiting the Pra Phnom Health Centre, the delegation went to Chankrey Ting, a rural health facility receiving technical support through GIZ. Unique from others, a female midwife oversees this health facility. Responsiveness to patient requests and customer service approach impressed the delegation, which is also reflected in the high number of women choosing this health centre for obstetric care. Additionally, the delegation met with commune councils and the community, including Khmer Muslims, who expressed their appreciation for Germany’s support to the promotion of client rights and the monitoring of client satisfaction. Commune councillors requested German Development Cooperation support to address issues of people with disabilities, elderly and chronic diseases in a systematic manner. At EpicArts Café, the delegation intensively exchanged with people living with disabilities, to learn more about their daily challenges. The delegated also visited a provincial hospital, where they were able to visit the functioning maternity department. In this department, complicated child delivery, safe abortion, new-born care and referral services offered. The delegation was also once more impressed by the preceptor-training programme, which aims to improve the quality practical training of nurse and midwifery students. Kampot Province, Cambodia – Despite the progress achieved during the last decade, Cambodia’s health indicators are still among the worst in Southeast Asia. Huge inequities exist between rural and urban population and between the wealthiest and the poorest quintiles. 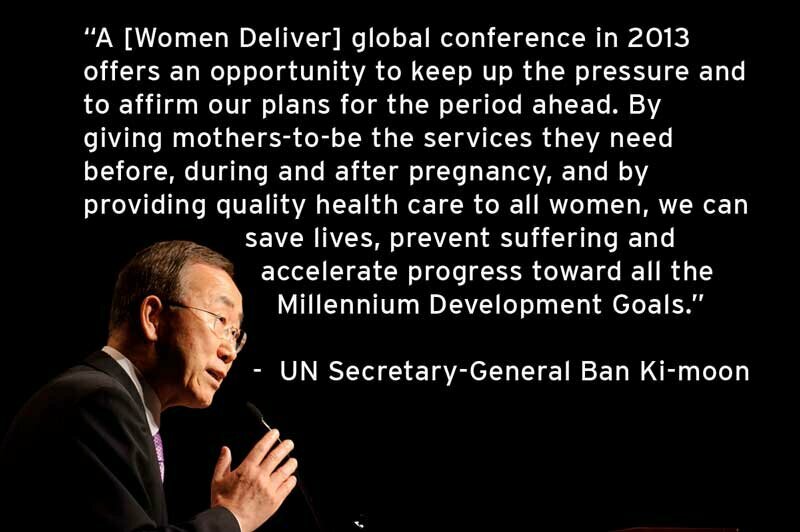 High risk deliveries contribute to high maternal and new-born morbidity and mortality. Reasons lie in inadequate antenatal care and unqualified attendance during emergency obstetric and new-born care, especially at the health centre level. 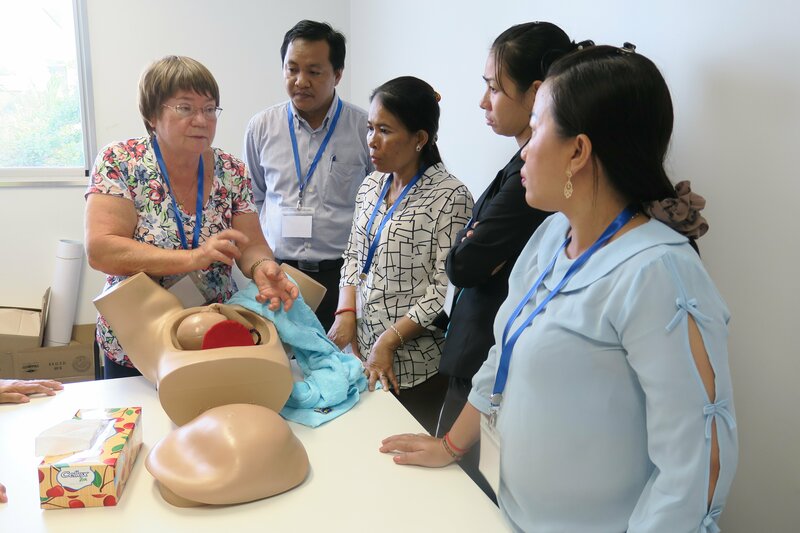 “The challenges in Cambodia are multi-faceted: high-risk pregnancies are not always observed, or not treated correctly; health professionals lack clinical skills; and health facilities are not well equipped to deal with emergencies,” Klaus Hornetz Project Manager explained. In addition to these development hampers, health referral and transport systems are underdeveloped and a majority of the population, particularly in rural areas, lacks the financial means to cover transport costs even if ambulance services are available. “The knowledge of the population to detect risk signs during pregnancy and childbirth and to seek treatment in time is low or non-existent. Our partners in the Ministry of Health and the provinces are trying to turn this fact around, and we are key supporters” Klaus Hornetz Project Manager continued. The project takes on a two-level approach: it works to strengthen both the demand and supply side, which has proven to lead to an effective and efficient improvement of maternal and new-born health indicators. Furthermore, the project has added value and created synergy effects with other projects and programs within social health protection throughout Cambodia. Despite recent efforts, a trained midwife shortage persists. Commonly, midwives working in rural health centres have undergone short vocational trainings, lasting a couple of months at the maximum, and thus exhibit only basic knowledge, especially with regards to emergency obstetric care. To overcome this challenge, the project has employed highly skilled midwives, which are assigned to conduct intensive ‘on-the-job’ capacity building exercises with trainee midwives from the 10 target health centres. Once trained, the midwives should be able to contribute to higher quality obstetric care. Together the midwives focus on delivery care as well as ante- and postnatal care. 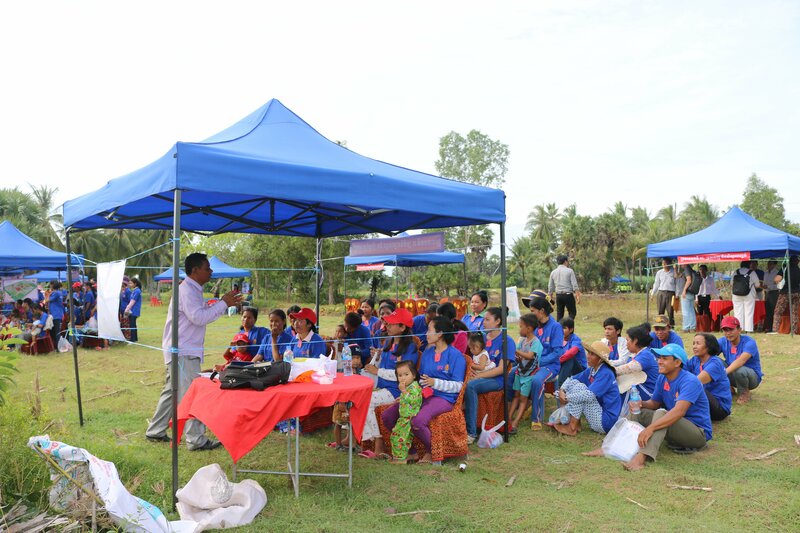 The trainees are also accompanied during outreach activities to remote villages. In addition to the direct skills impact of the trainings, the aim is also to induce changes in the behaviour and attitude of medical personnel towards their clients. The participation of the community is essential for the success of each health project. The project plans to conduct intensive awareness sessions at the village level to promote deliveries in medical facilities; to strengthen the linkage between health centres and communities; and to increase local knowledge on how to make motherhood safer. “We hope for this project to not only enhance capacities among the public health care providers, but to also ensure that public health services respond to the patients’ needs,” Klaus Hornetz, said. Phnom Penh, Cambodia – Last month, the GIZ Social Health Protection Project and the GIZ Rights–based Family Planning and Maternal Health Project invited key partners for a consolidated planning workshop that would explore ways forward to improve health and social health protection for Cambodians and in particular for the poor and vulnerable. Dr. Sok Kanha, representative of Cambodia’s Ministry of Health opened the workshop. Over 65 participants attended as improving health care is a goal that cuts across sectors. The results of joint planning processes on provincial and operational district level were presented and consolidated with the national annual operational plans. 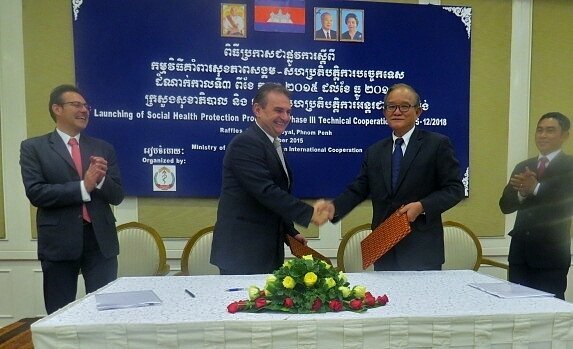 It was agreed that the German Technical Cooperation will support activities in 2013 up to USD2.7 million under the joint Cambodian-German Social Health Protection Programme (SHPP). Directly after the workshop, GIZ invited all participants to a hand- over ceremony of four ambulances and one minibus at the National Institute of Public Health. H.E. Prof. Eng Huot, Secretary of State of the Ministry of Health, and Dr. Petra Schill, Acting Country Director of GIZ Cambodia presided over the ceremony. As Dr. Schill mentioned in her welcome remarks, ‘this special support for ambulances and medical equipment is an important contribution to strengthen the referral system in the health sector’. ‘It ensures that patients can be quickly and safely transferred to the next and most appropriate health facility in the provinces of Kampot, Kampong Thom and Kampong Speu,’ she added.